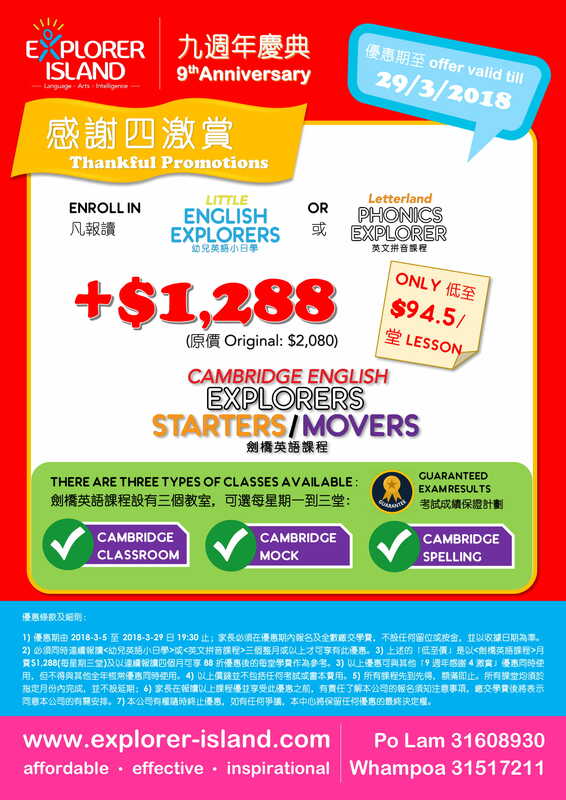 For more details, please call 31608930 or Whatsapp 69200629 now! 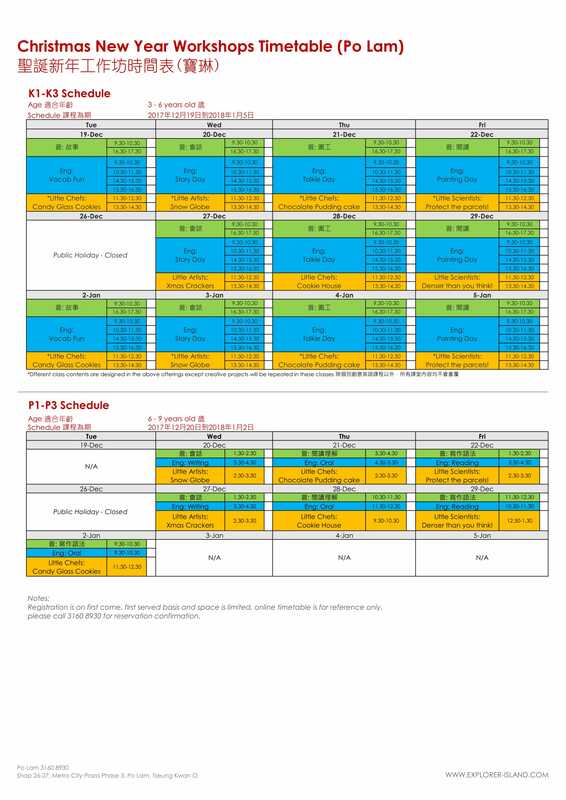 Save the dates! 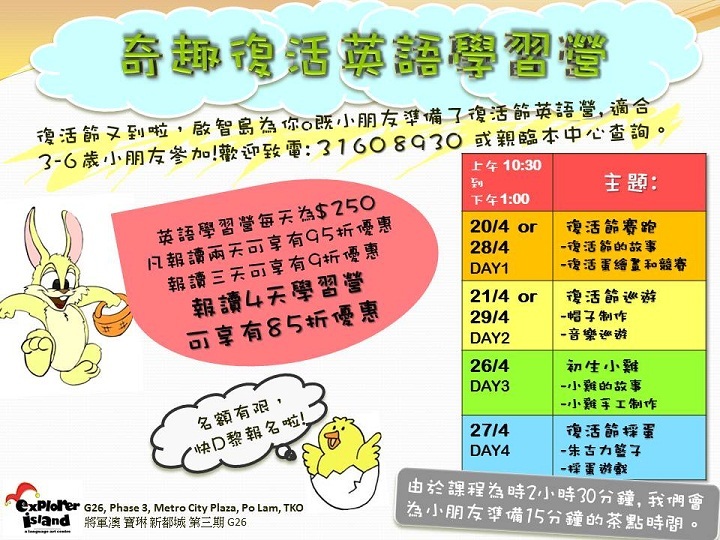 Save the dates! ! 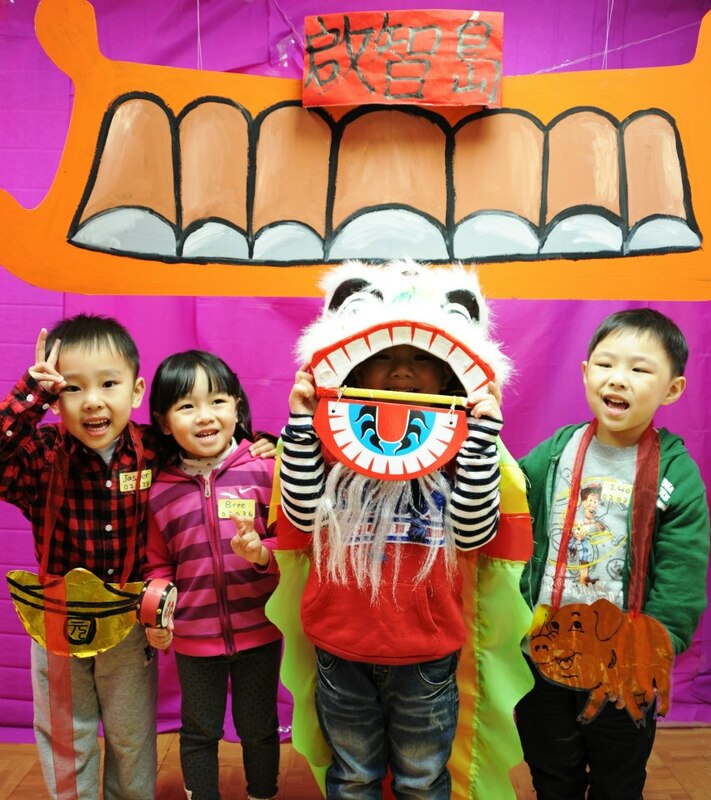 We are hosting a series of celebratory events and classes! 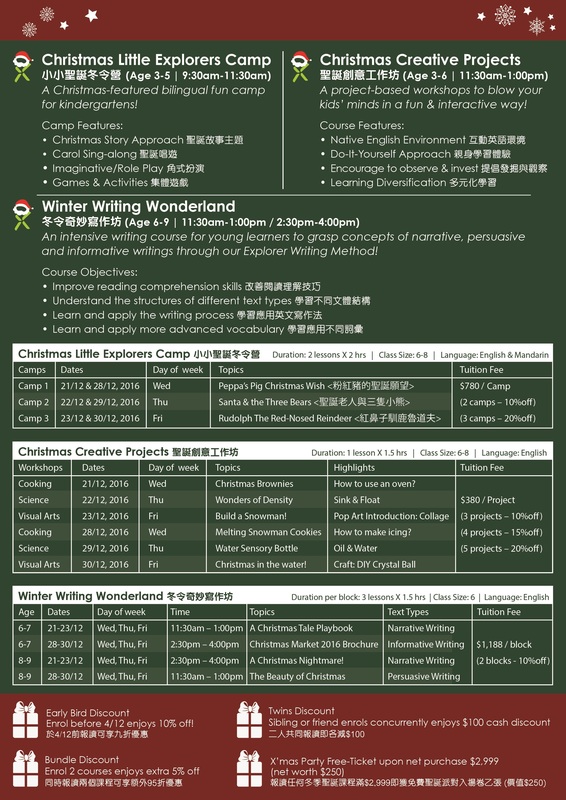 Spots are limited, so sign up and experience the festive spirit before it’s too late! 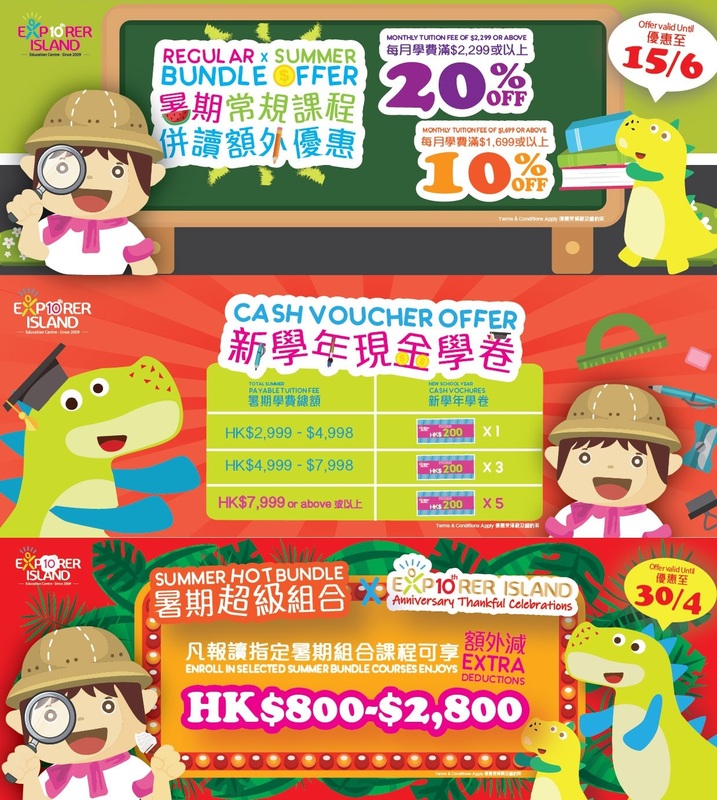 Enjoy 10% early bird discounts on or before 30/11! 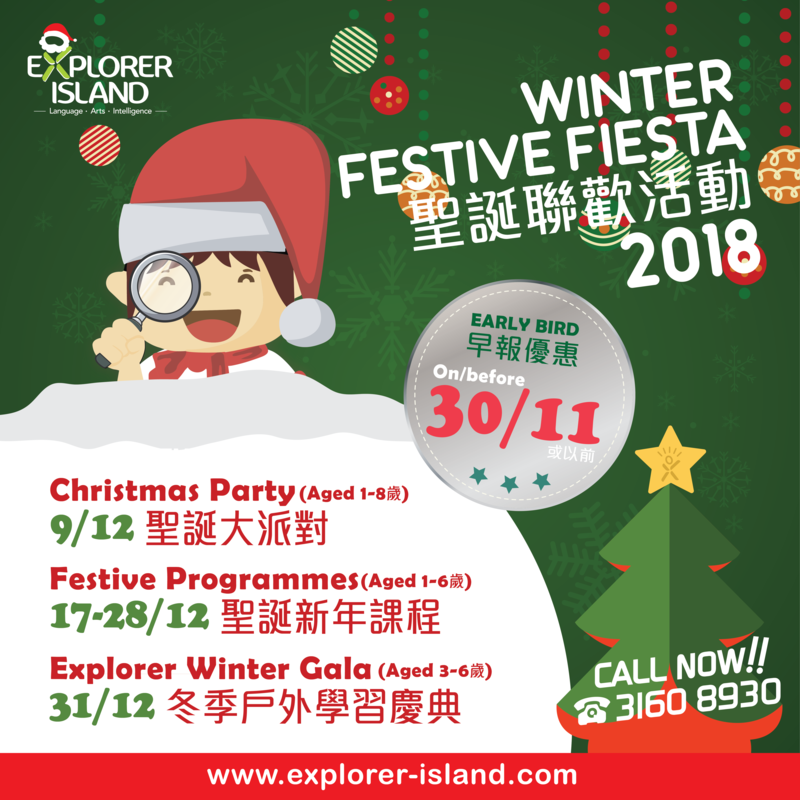 ✔介紹新朋友參加任何< Winter Festive Fiesta 2018 冬季聯歡活動> 滿指定金額均可以半價參加 2018 Explorer Winter Gala - Study Trip 啟智島冬季戶外學習慶典! Christmas is around the corner. 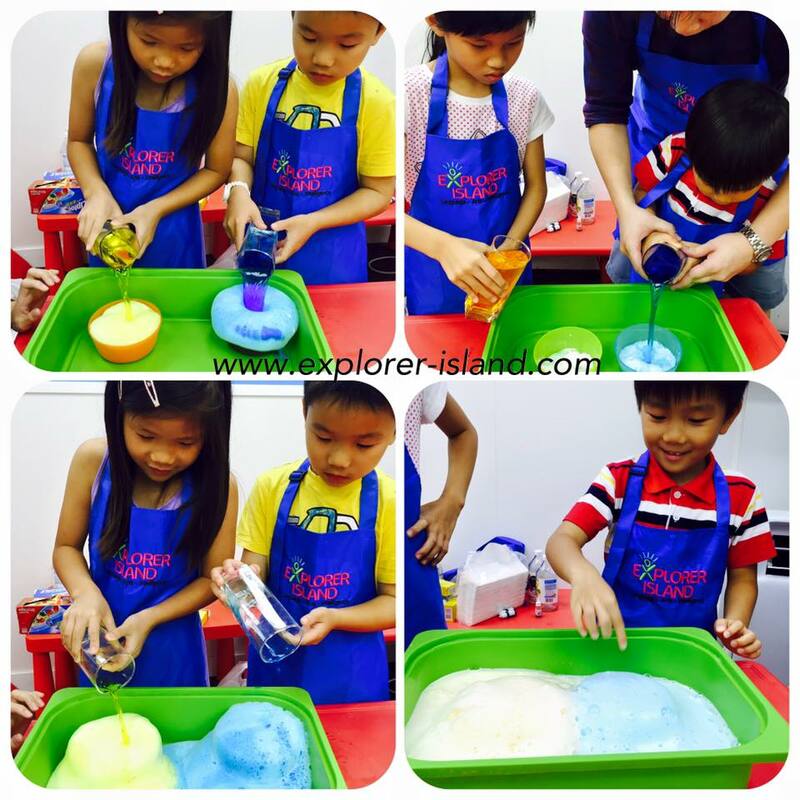 Explorer Island has prepared a series of fun workshops for 3-9 year olds! 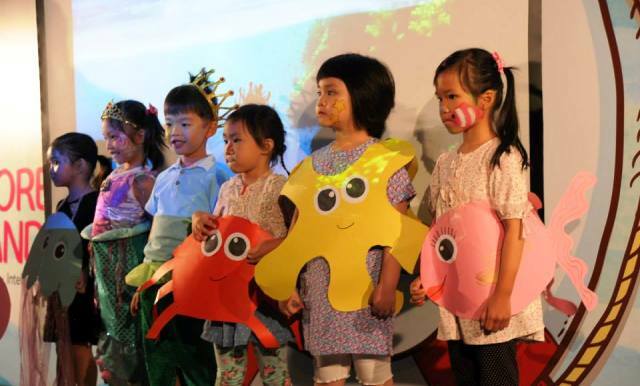 From thematic creative learning for kinders all the way to writing workshops for primary! 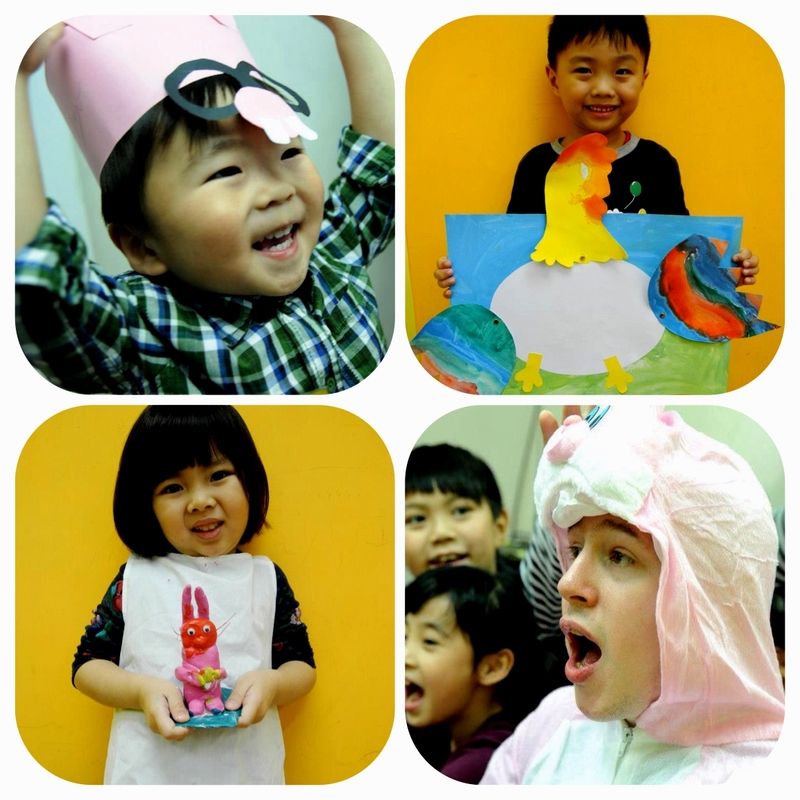 Come & have fun with us iby enriching your little ones through muiltiple learning experiences this Christmas! 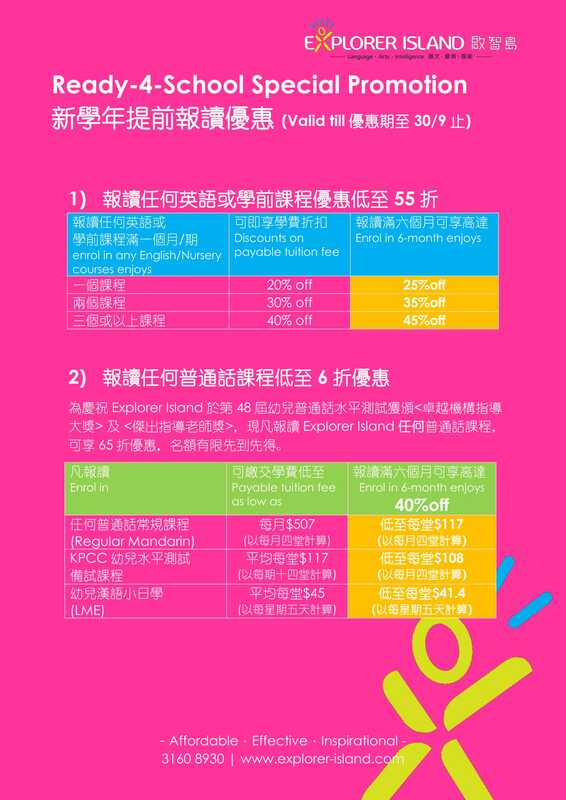 Join on or before 9/12 to enjoy up to 30% off, bring your friends together get an extra cash discount up to $400! 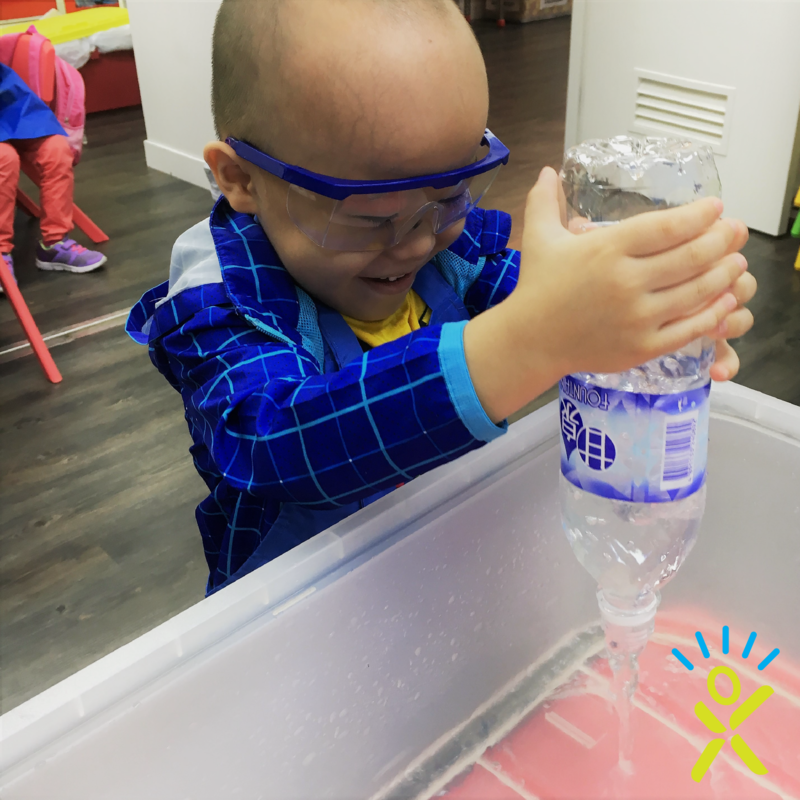 A series of fun workshops engage with stories, songs, games & laughters to boost kinders' language skills! 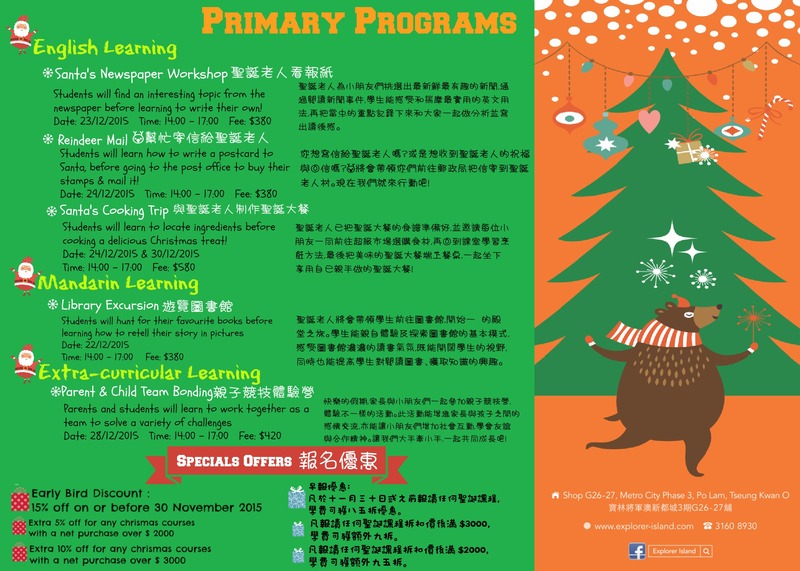 A series of language workshops designed for primary students with interesting festive topics including writing letters to Santa, learning how send out parcels oversea, designing a Christmas comic strips and many more! 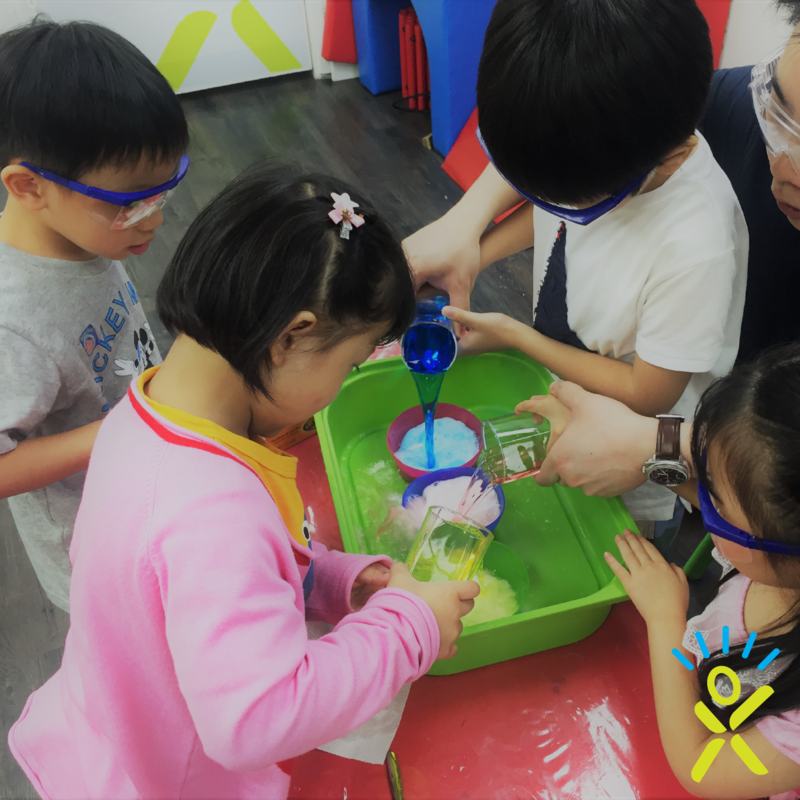 Our all-time-favourite short courses, young learners get to be creative, projects including making Stained Glass Cookies, creating a snow globe & learning about density by doing experienments! 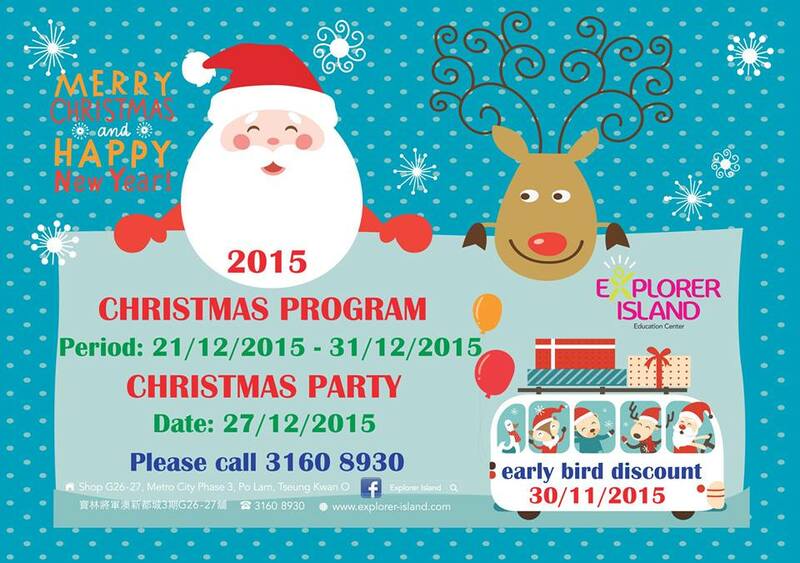 Don't miss out an amazing Christmas with us, call 31608930 now for more information! Save the date! 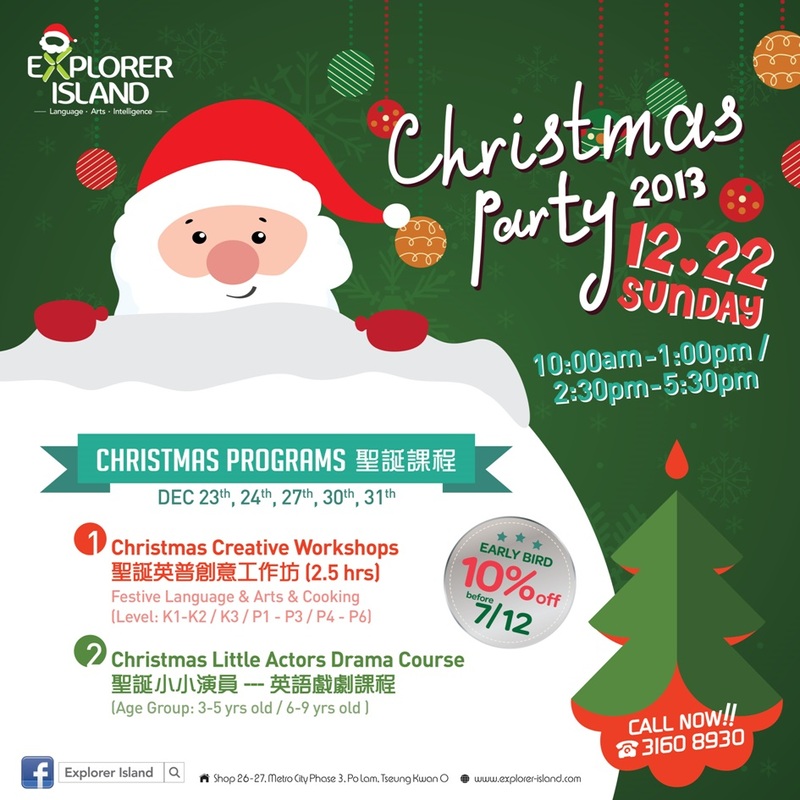 You are invited to Explorer Island Christmas party. Come and have of fun with our Santa Claus!!! 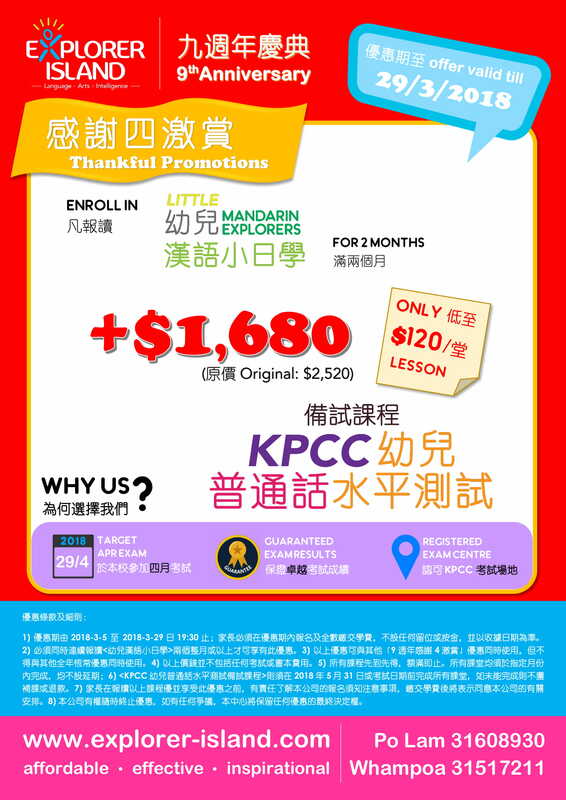 Limited seats, call us to reserve a seat now! 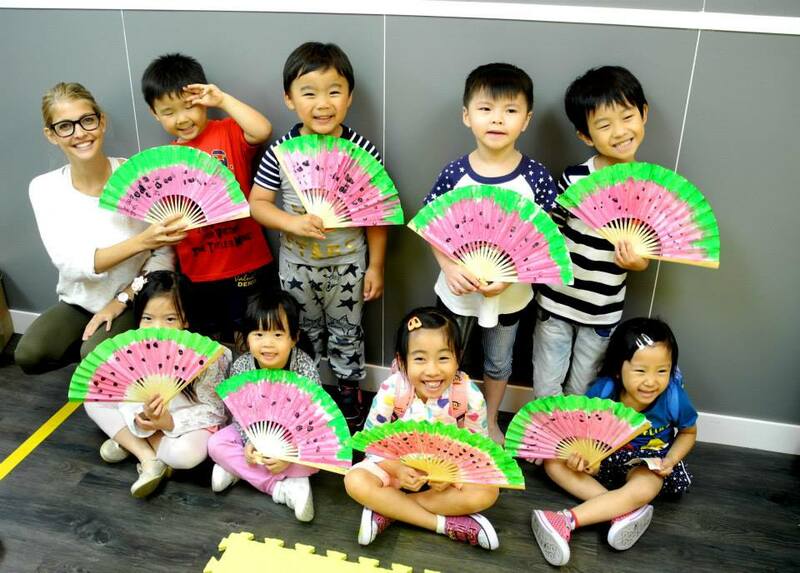 · and lots of fun! 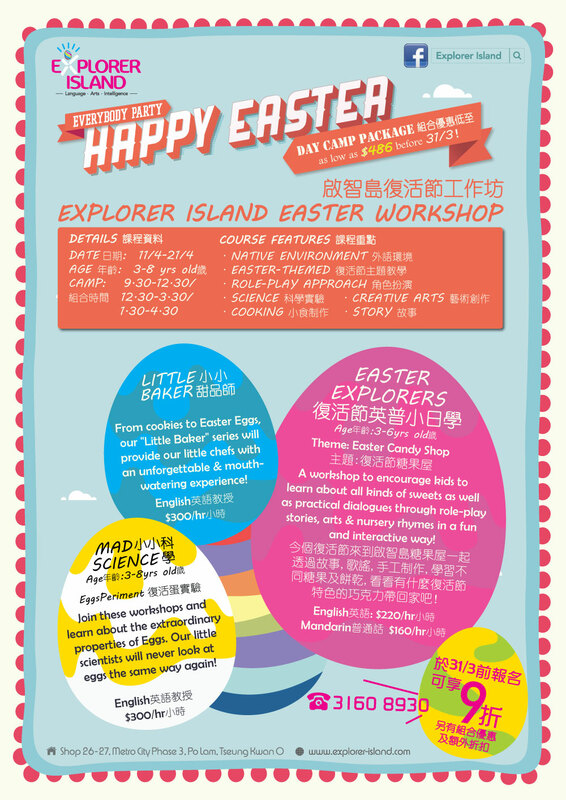 Science, Cooking, arts & crafts, storytelling with songs, science...enriching your little ones through an EGGs-citing Easter! 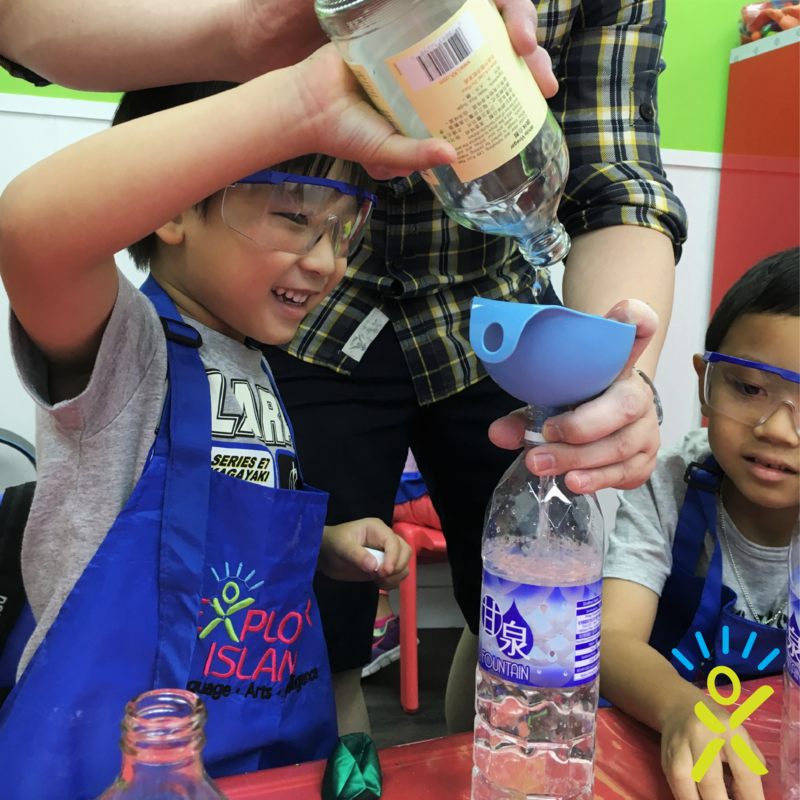 ExplorerIsland has prepared a series of fun workshops for 2-8 year olds! 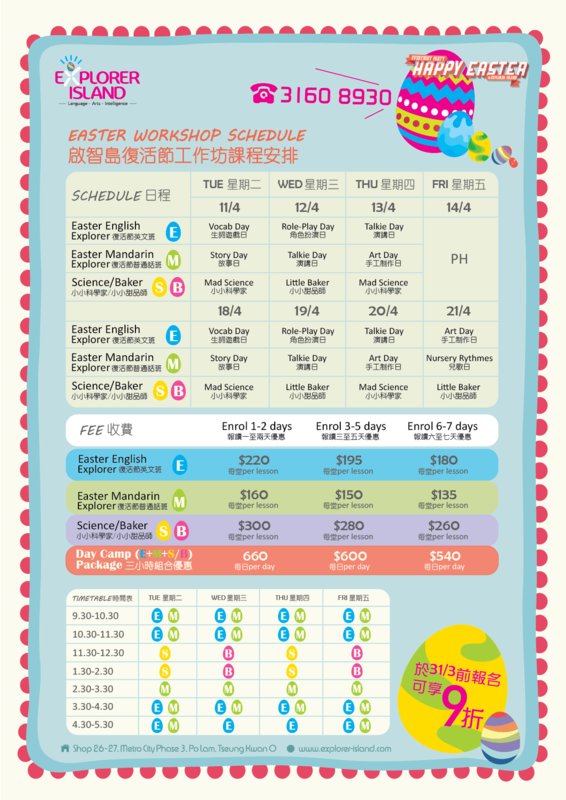 The workshops include a range of exciting themed classes with a 3-hr Day Camp Package available, as low as $486 before 31/3! Limited seats, so don't miss 10% off Early Bird Discount on/before 31/3/2017! 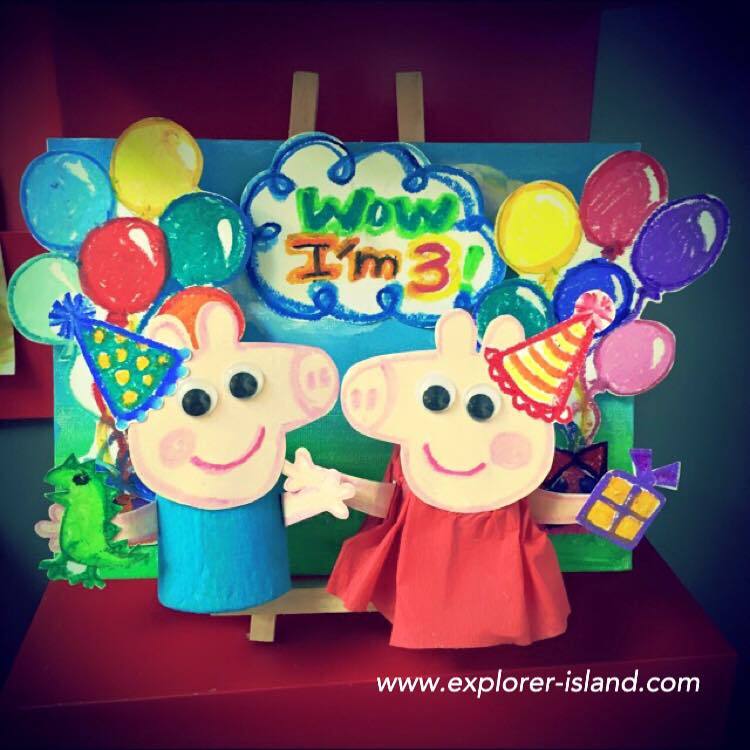 Explorer Island's Party is BACK! One of the most popular events of the year, Christmas Party 2016, is now open for registration! Come & have an amazing party with us & the Santa! 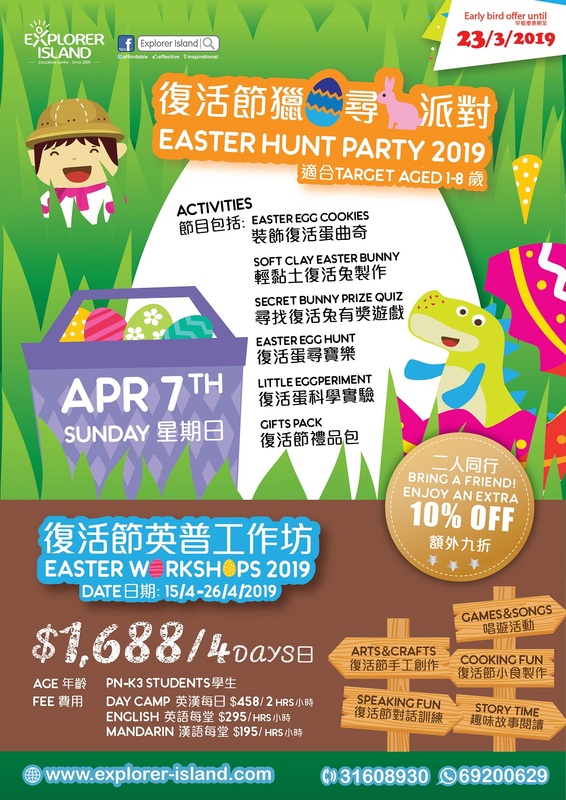 Register before 4/12 to enjoy a 10% off! Bring your friends together, limited seats, call 3160 8930 to make a reservation! Christmas is around the corner. 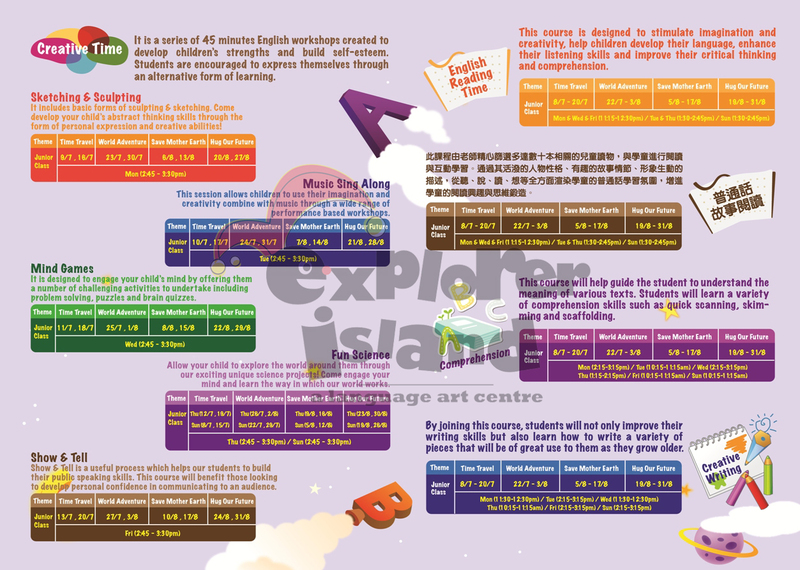 Explorer Island has prepared a series of fun workshops for 3-9 year olds! 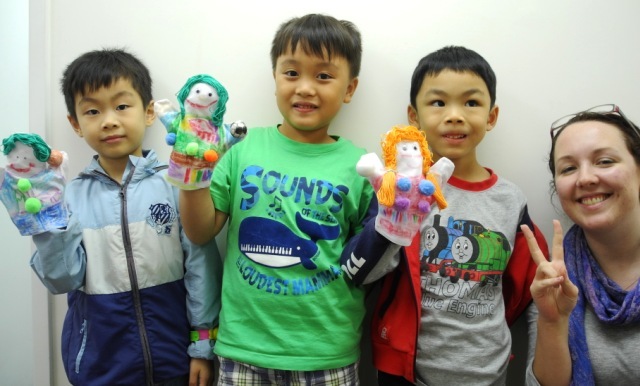 From thematic creative learning for kinders all the way to writing workshops for primary! 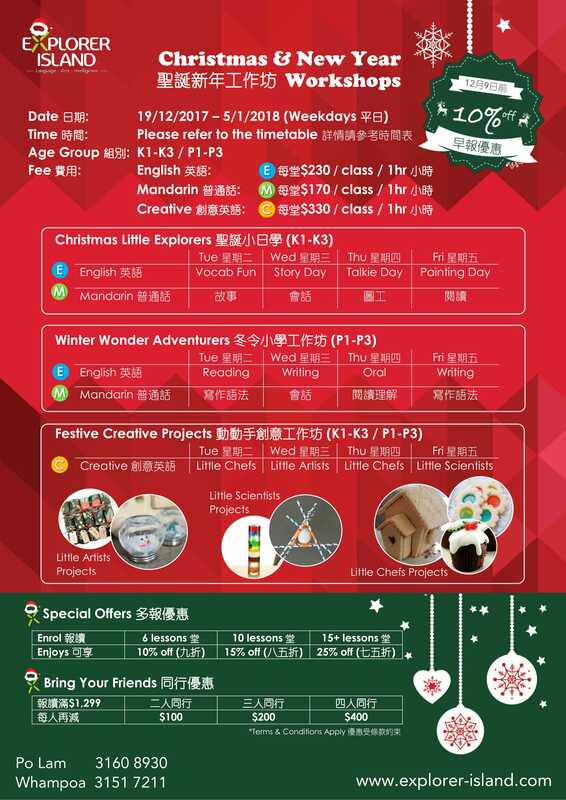 Come & have fun with us iby enriching your little ones through muiltiple learning experiences this Christmas! 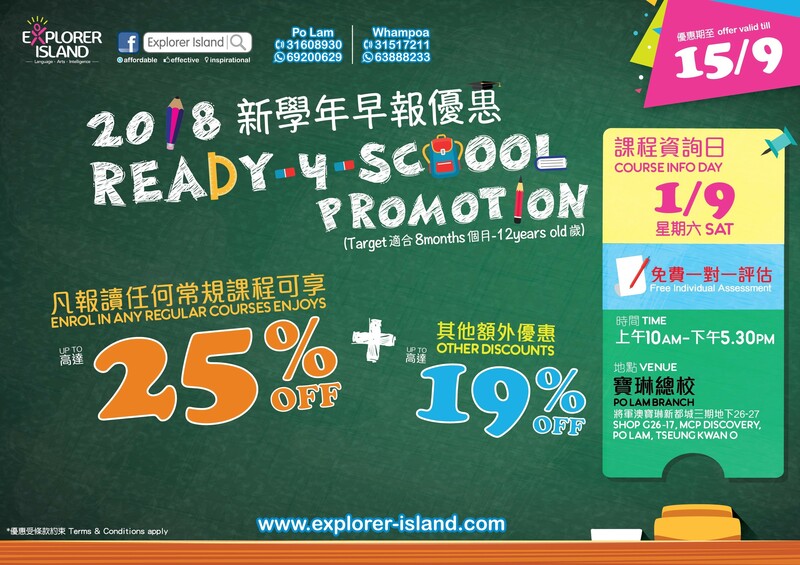 1) 10%Off Early Bird Discount - Enrol now to enjoy special 10% off before 4/12! 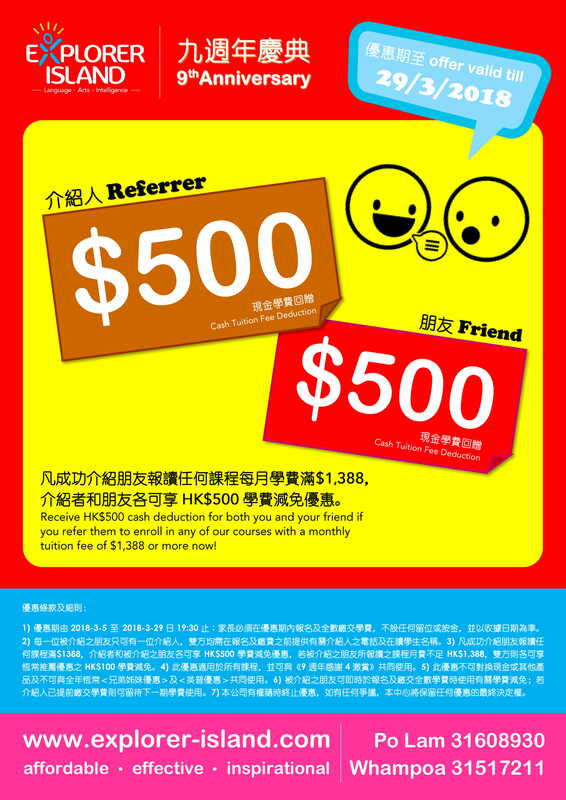 2) Twins Discount - Sibling or friend enrols concurrently enjoys $100 Cash Discount! 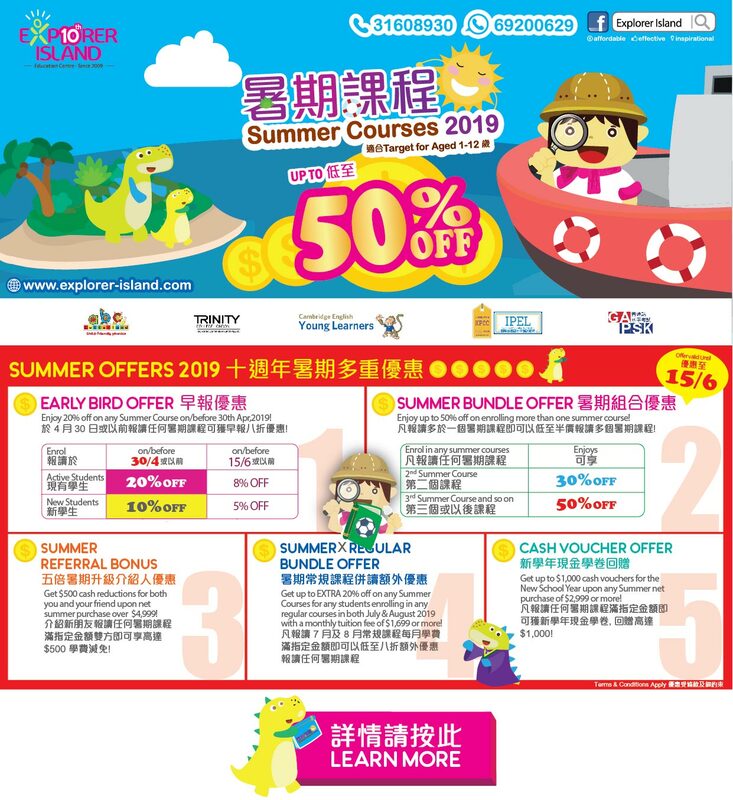 3) 5%Off Bundle Discount - Enrol in 2 courses enjoys 5% off! Here we come, a new school year! 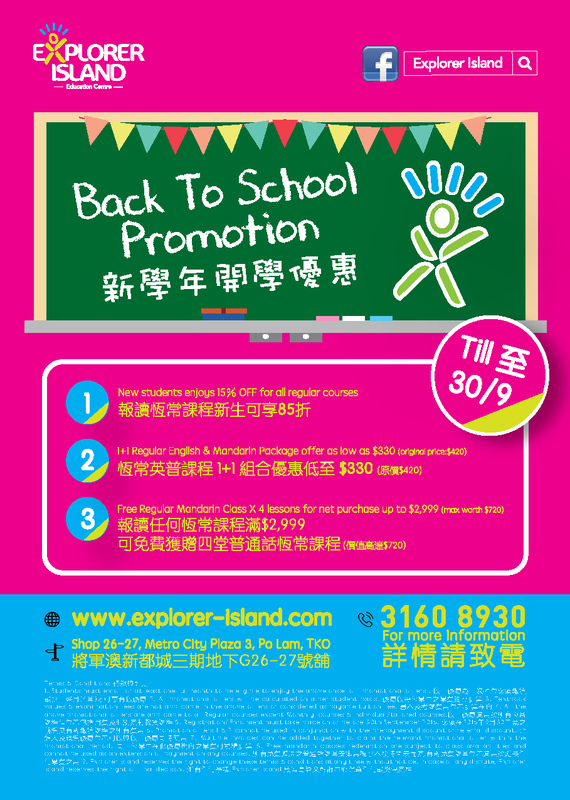 A series of "Back-to-School" promotions is now released till 30/9! Call us to book a FREE assessment now! 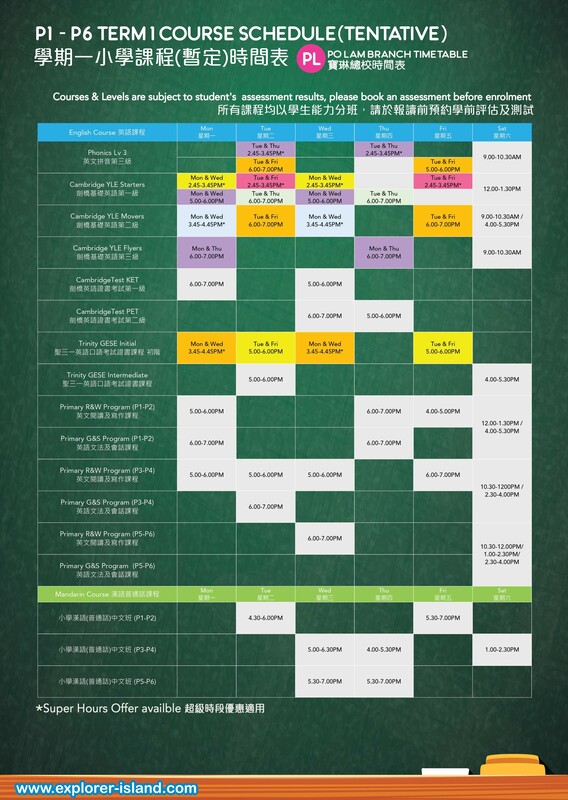 當然不少得我們的熱門課程，當中包括聖三一英語水平測試課程 (Trinity GESE)、暑期法文 (French)、英語拼音精讀課程 (Letterland Phonics)、普通話朗誦課程 、普通話拼音課程以及 KPCC普通話水平測試備試課程；每年最受歡迎的暑期英語話劇課程Summer English Drama Fun ，讓學童透過遊戲及合作，增強自信，建立表演技巧！更不能錯過的是資優博士課程 - Think Impact Program是一個啟發學童智能的IQ課程，專為小學生而設，提升學童的創意思維，Think out of the box! 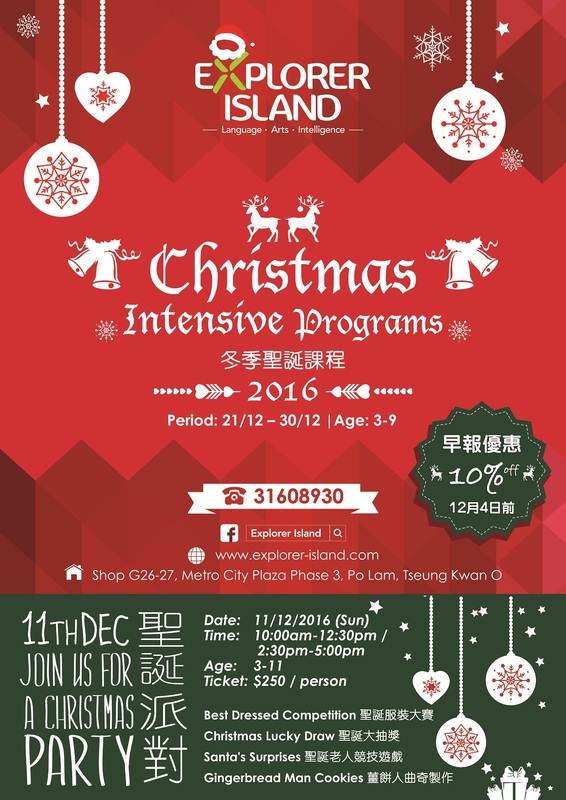 EXPLORER ISLAND既2015 CHRISTMAS PROGRAMS & CHRISTMAS PARTY 又黎啦! 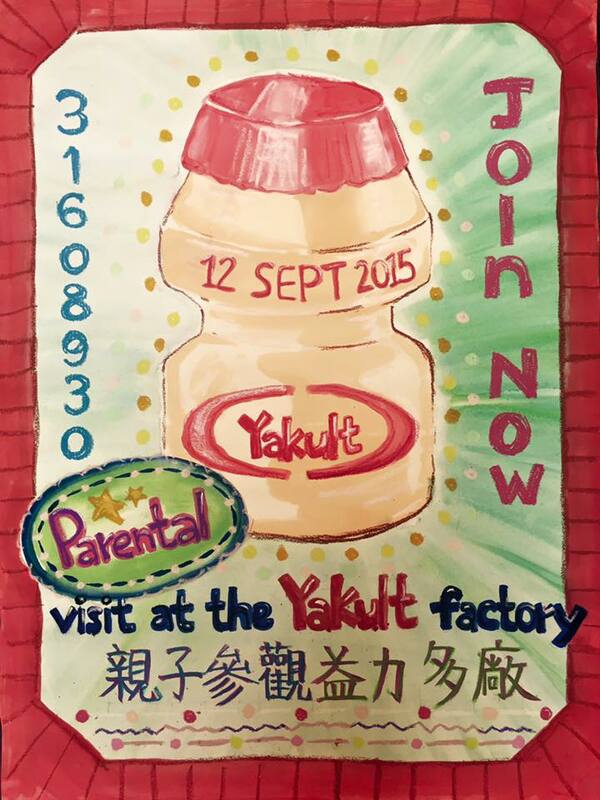 YAKULT factory tour tickets with any summer hot course purchase! Free admission on a first come first serve basis. 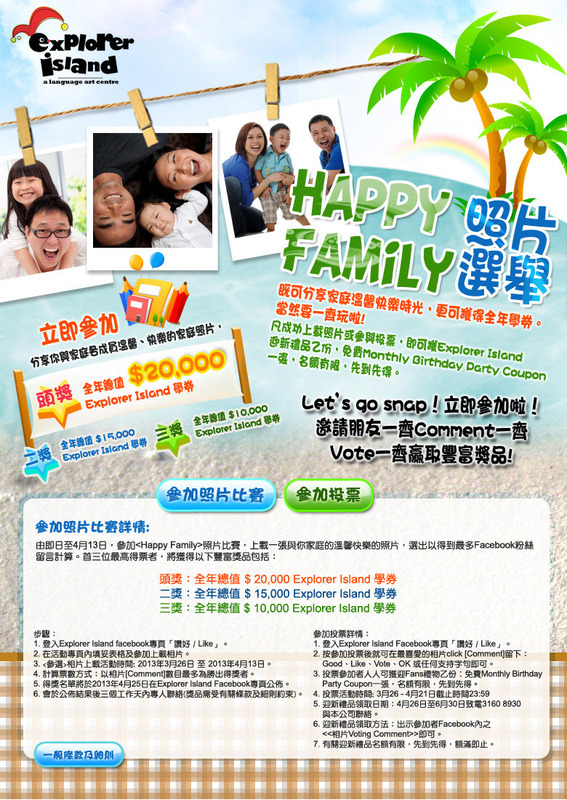 Please contact us on 31608930 for more details! 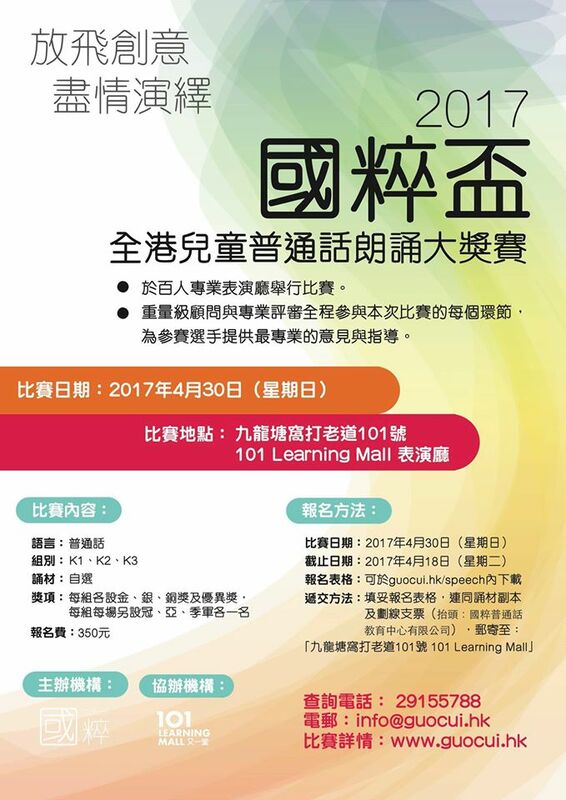 當然不少得我們的熱門課程，當中包括聖三一英語水平測試課程 (Trinity GESE)、角色扮演課程 (Role Play)、柔術課程 (Jiujitsu)、英語拼音精讀課程 (Letterland Phonics)、普通話朗誦課程 、普通話拼音課程以及 KPCC普通話水平測試備試課程；每年最受歡迎的暑期英語話劇課程Summer English Drama Fun ，讓學童透過遊戲及合作，增強自信，建立表演技巧！更不能錯過的是資優博士課程 - Think Impact Program是一個啟發學童智能的IQ課程，專為小學生而設，提升學童的創意思維，Think out of the box! 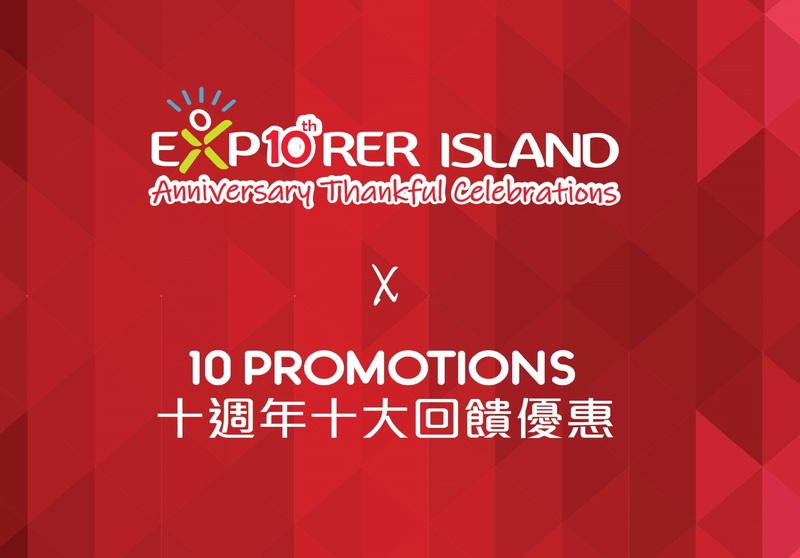 It's that time of the year again- Come and spend Halloween with us at Explorer Island! 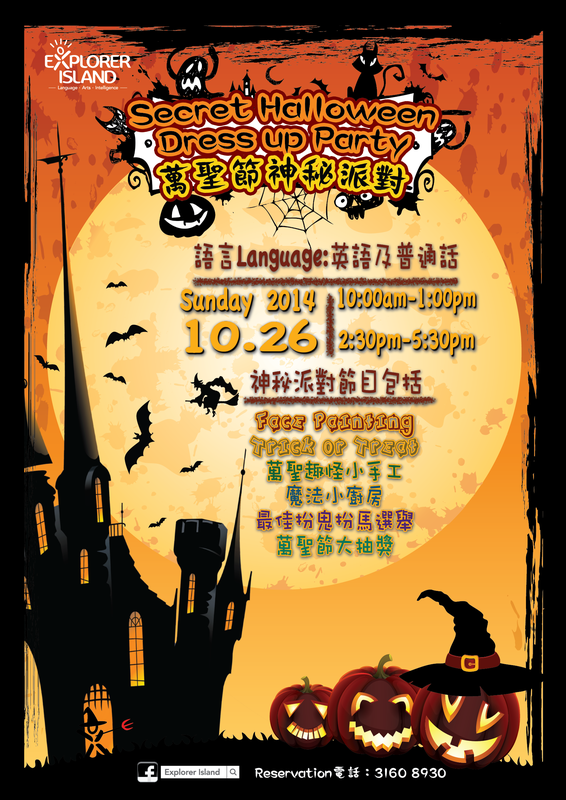 Activities include face painting, crazy dress up, games and much more! 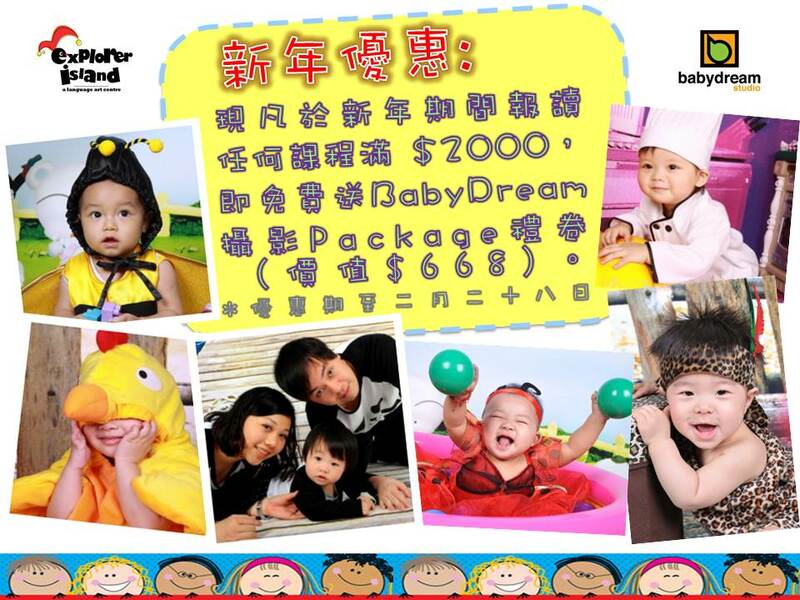 Call us on 3160 8930 for more details, but hurry as spots are limited! 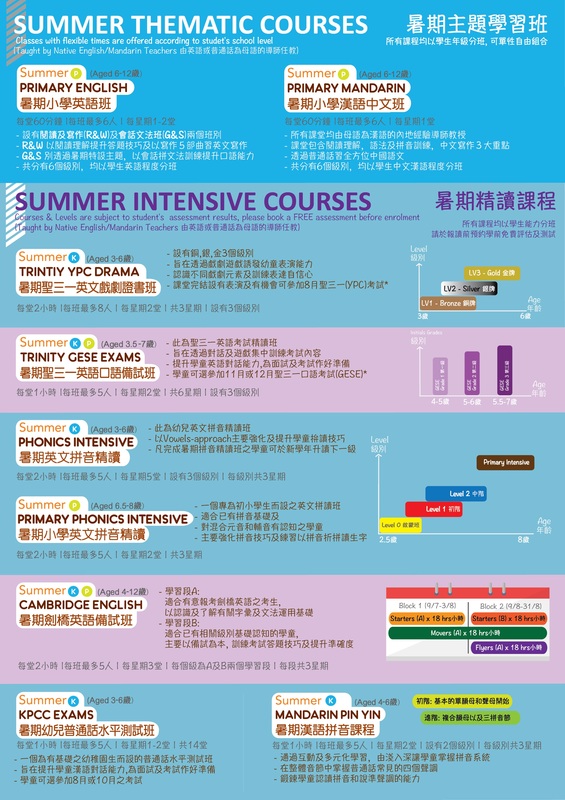 當然不少得我們的熱門課程，當中包括劍橋英語(Cambridge YLE)，聖三一英語口語 (Trinity GESE) 以及KPCC普通話水平測試備試課程；每年最受歡迎的莫過於是Summer English Drama Fun 暑期英語話劇課程，讓學童透過遊戲及合作，增強自信，建立表演技巧！去年推出的Think Impact Program是一個啟發學童智能的IQ課程，專為小學生而設，提升學童的創意思維，Think out of the box! 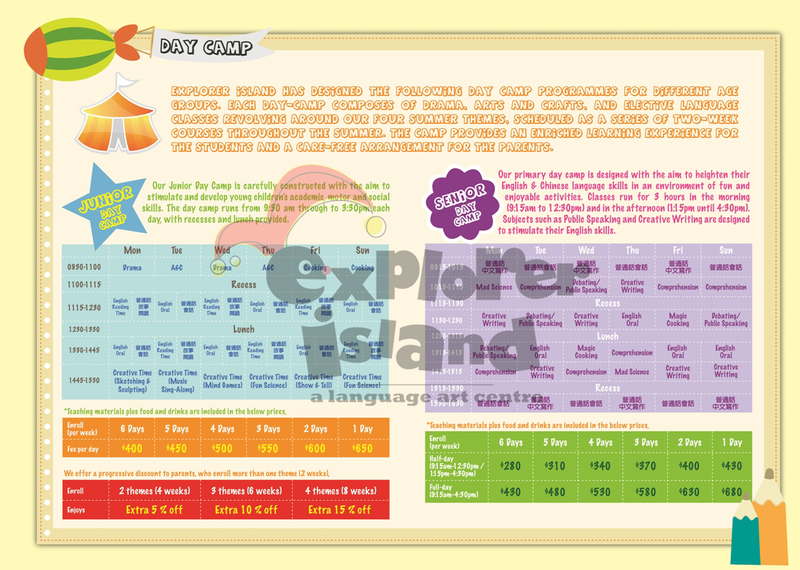 Santa Claus is coming to Explorer Island! Christmas is round the corner ! 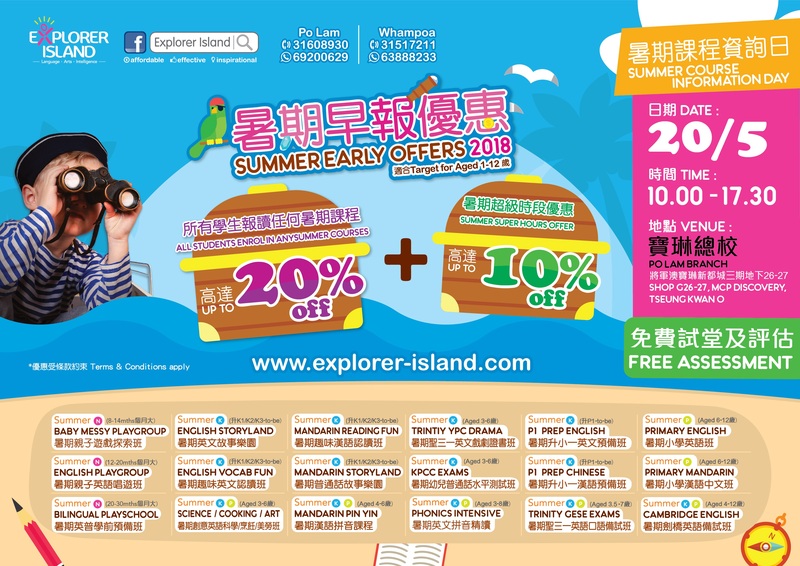 Bring your kids to Explorer Island, he/she will have a wonderful holiday with us. 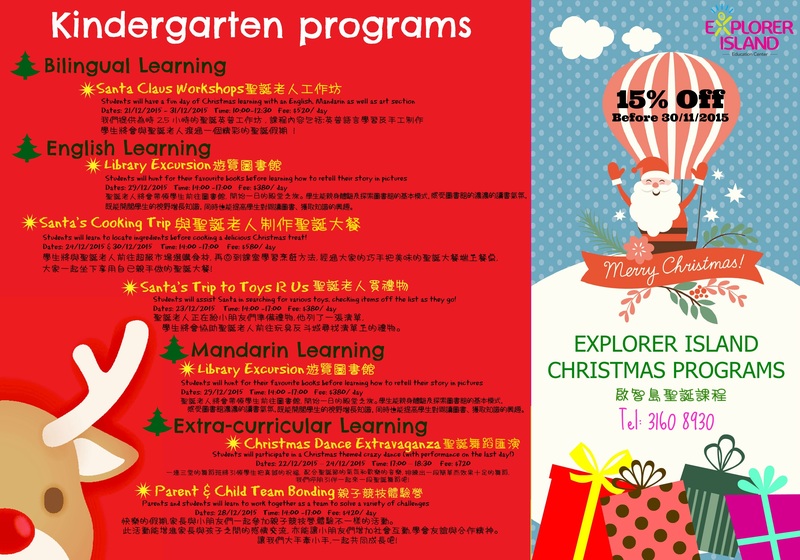 They will learn more aboutChristmas & New Year, our Christmas programs will be held on 23/12, 24/12, 27/12, 30/12 & 31/12. 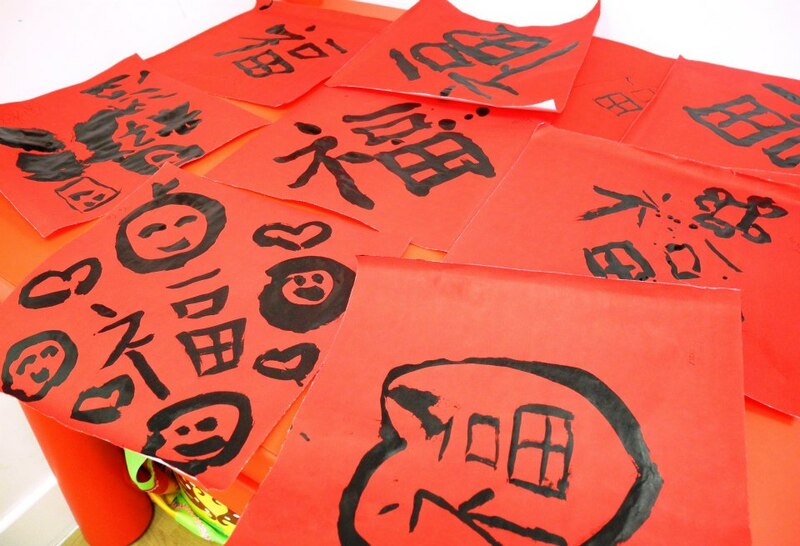 The workshops include a range of exciting bilingual themed classes and activities such as Magic Cooking (Mandarin) and Fun with English Arts & Crafts. 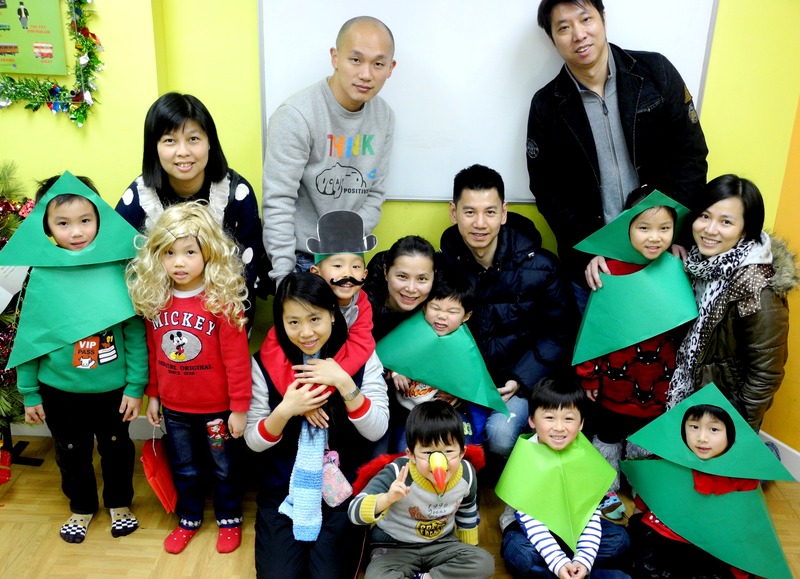 Primary students will create and present their own Christmas stories as well as to engage in different group projects in our bilingual workshops. 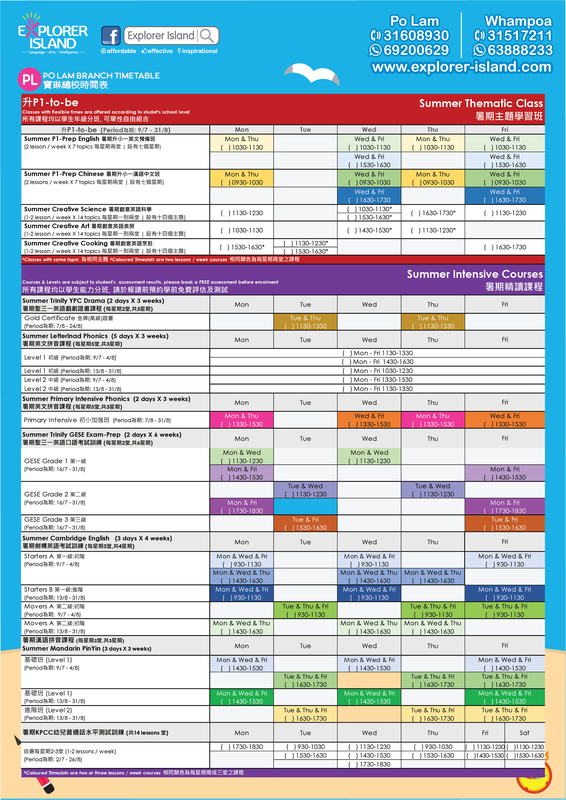 Drama course is one of our most popular courses. 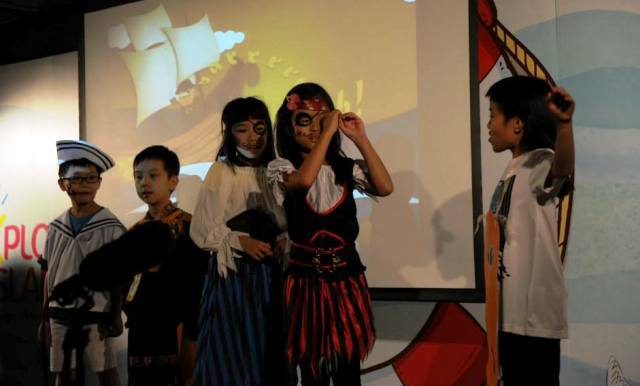 Our little actors will also perform to parents at the end of the course. 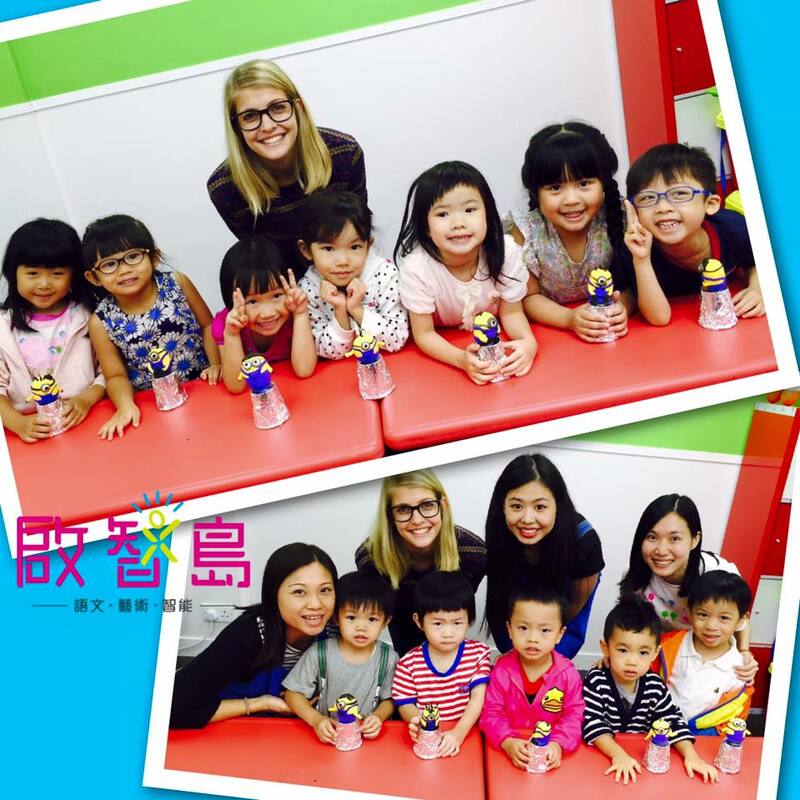 A great experience before they start a whole new year! Limited seats, so don't miss it! 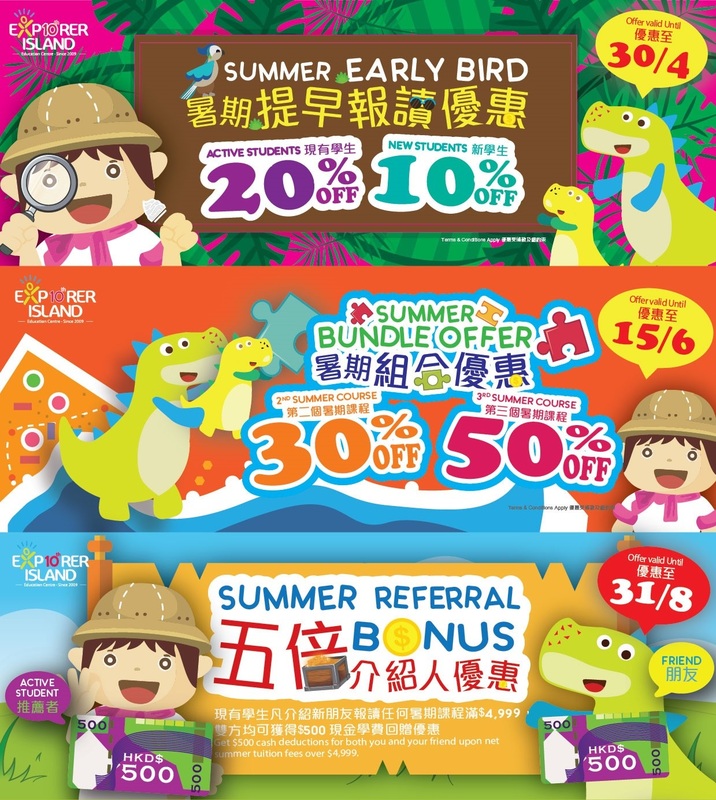 Enjoy your 10% off Early Bird Discount before 7/12. 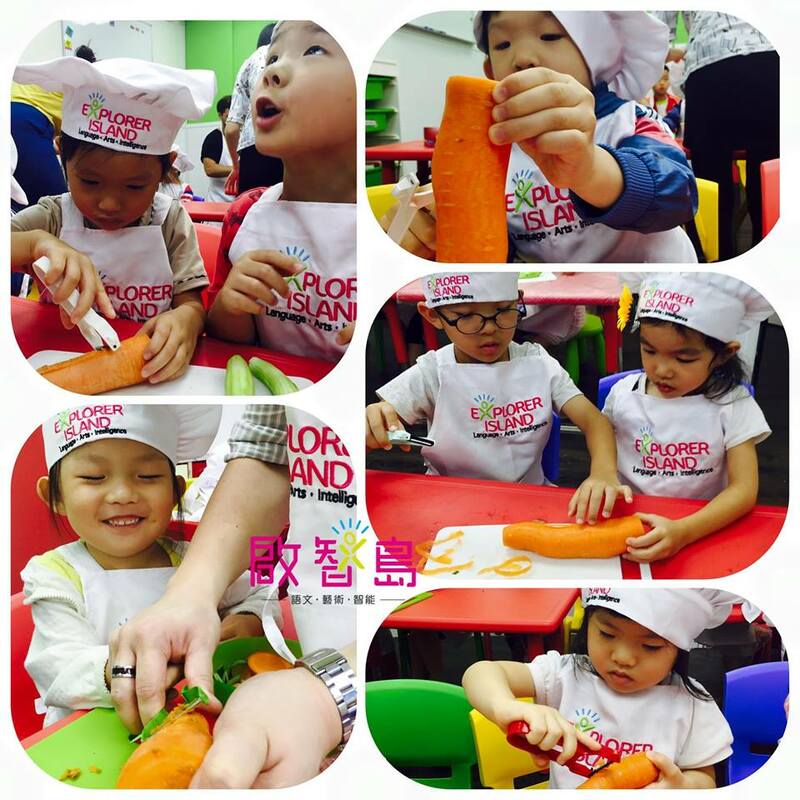 For reservations and enquiries, please call 3160 8930 or come to visit our centre. 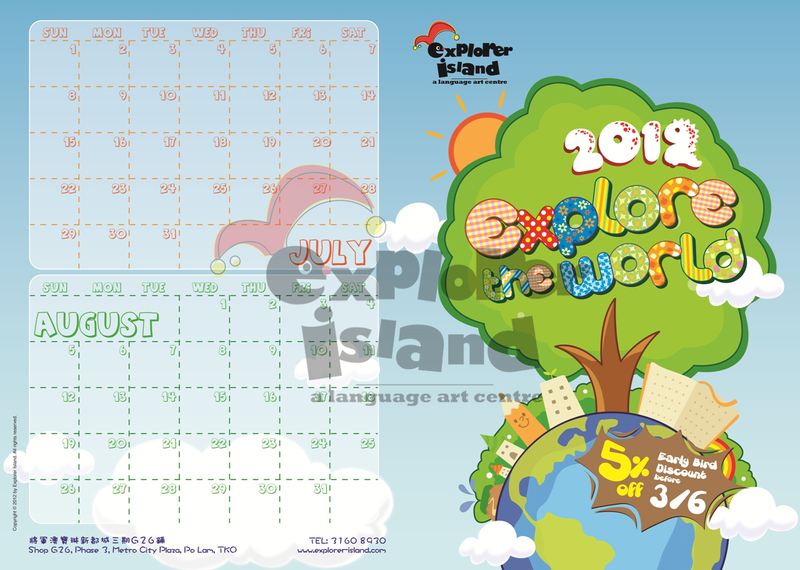 EXPLORER ISLAND has developed an exciting, fun-filled summer program to take your child onto a journey full of surprises and knowledge, to enhance their linguistic, creative and presentation skills. 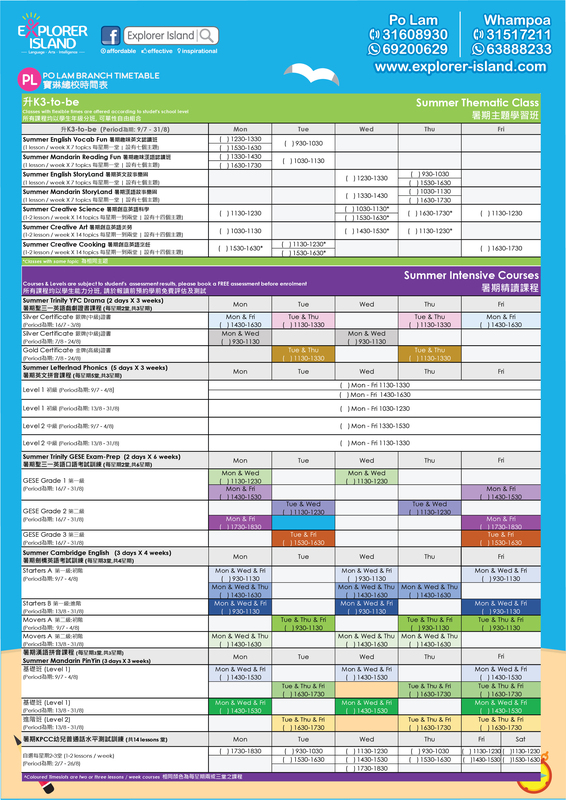 Our summer program, designed and developed for students from pre-K to P6 age groups, is comprehensive and flexible to suit your child’s summer schedule. 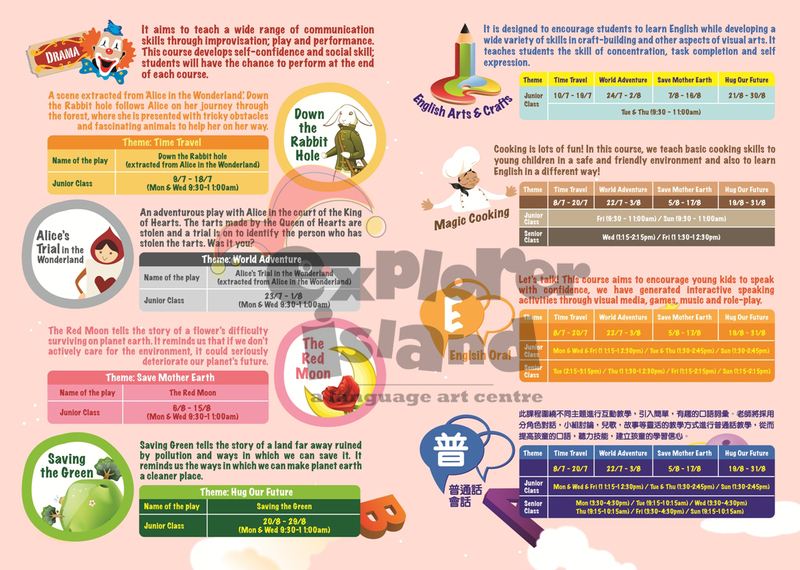 Student can enroll to our Day Camps (3h45m) or Workshops (2h30m) , or individual modules such as Drama and Exam Preparation courses. 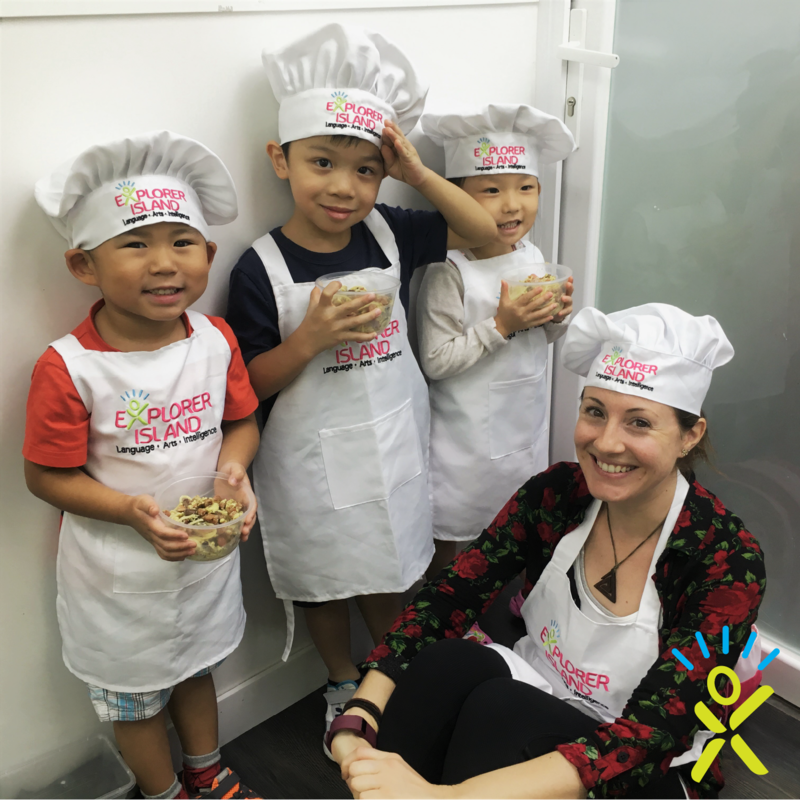 Our eager team is excited to bring a unique and memorable learning experience to your child. 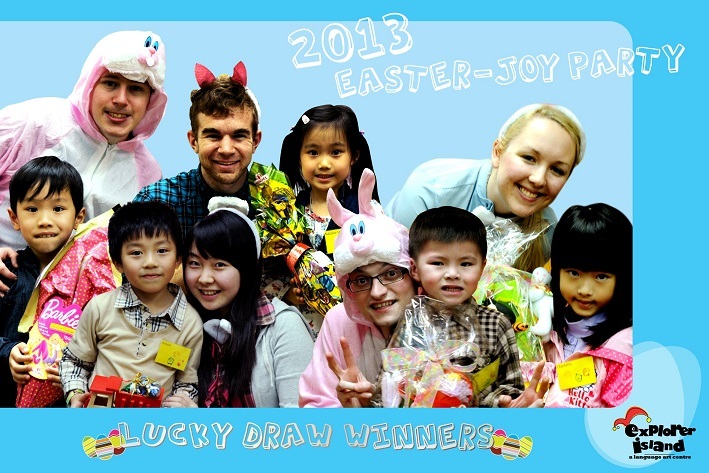 2013 Easter-Joy Party Lucky Draw Winners! 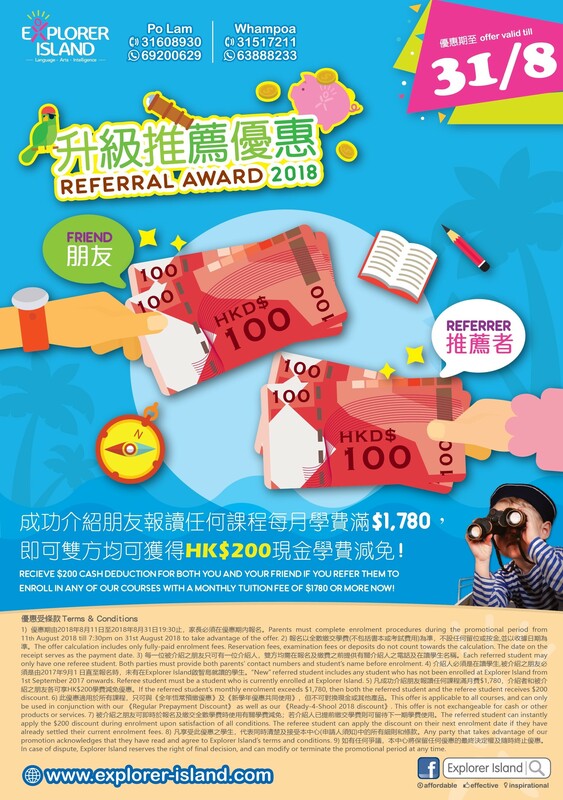 凡參加選舉或投票, 即可獲Explorer Island免費Monthly Birthday Party Coupon一張, 名額有限, 先到先得! It's gonna be lots of fun. Don't miss it, call 31608930 for reservations now! 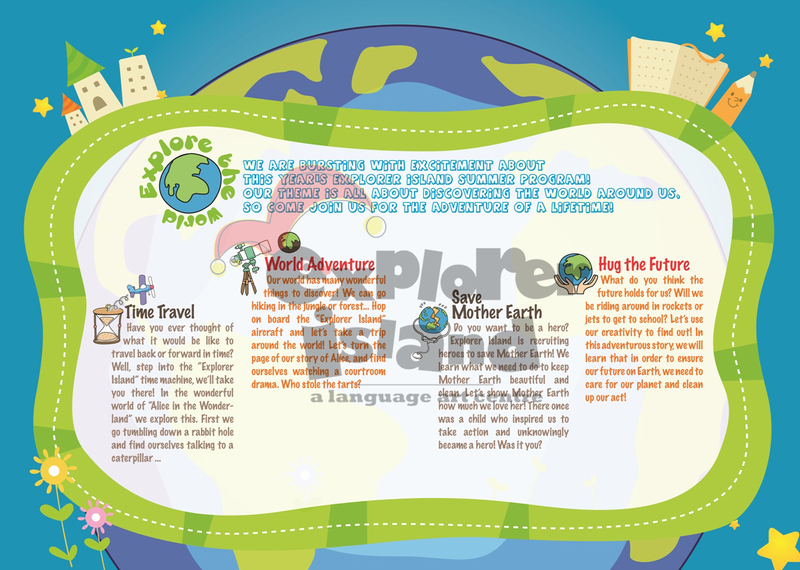 2012 Summer Program - Explore The World !!! Come and explore the world with us, let's travel around and take care of Mother Earth, it's gonna be an adventurous journey. 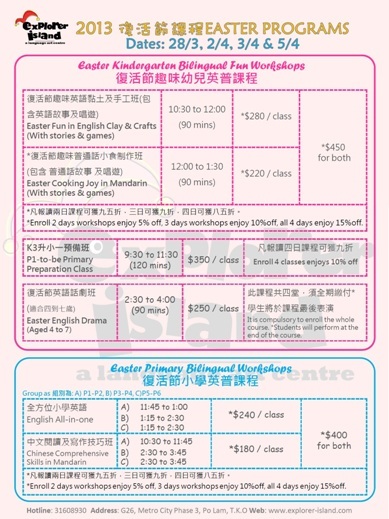 For enquiries, please call 3160-8930 or come visit our centre! 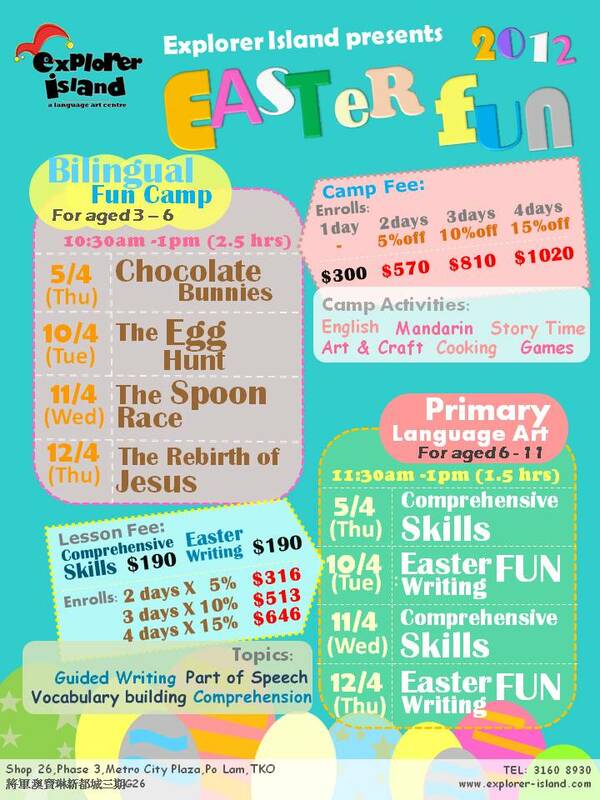 To celebrate jesus, come and join our fun filled yet educational Easter camp, both camps are tailor-made for K1 - P5 students. Come and have fun with us. Limited seats, call 3160 8930 for reservations! 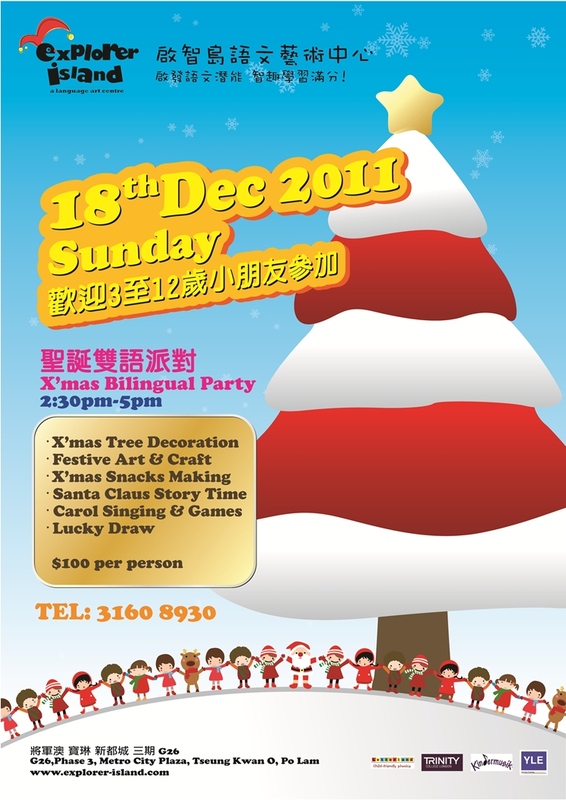 Join our X'mas Bilingual Party to celebrate the festival! 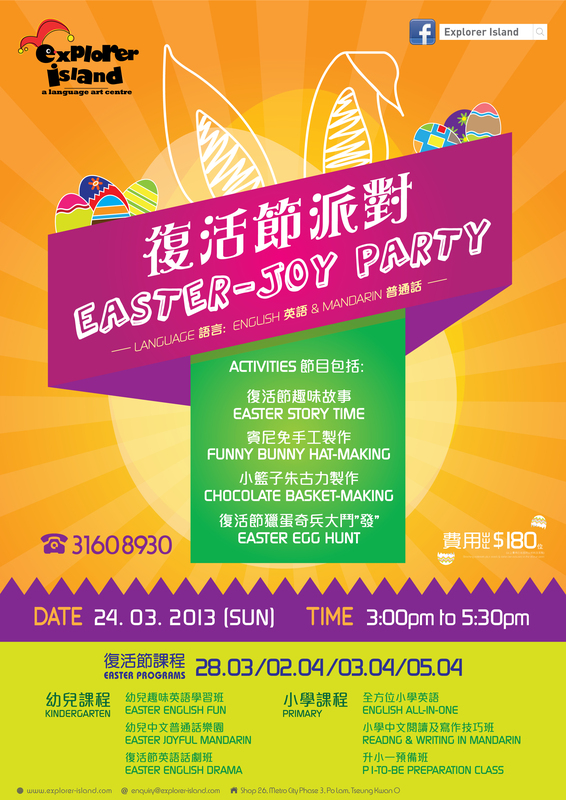 Come & have fun with us! Call 3160 8930 for reservations to avoid disappointments! 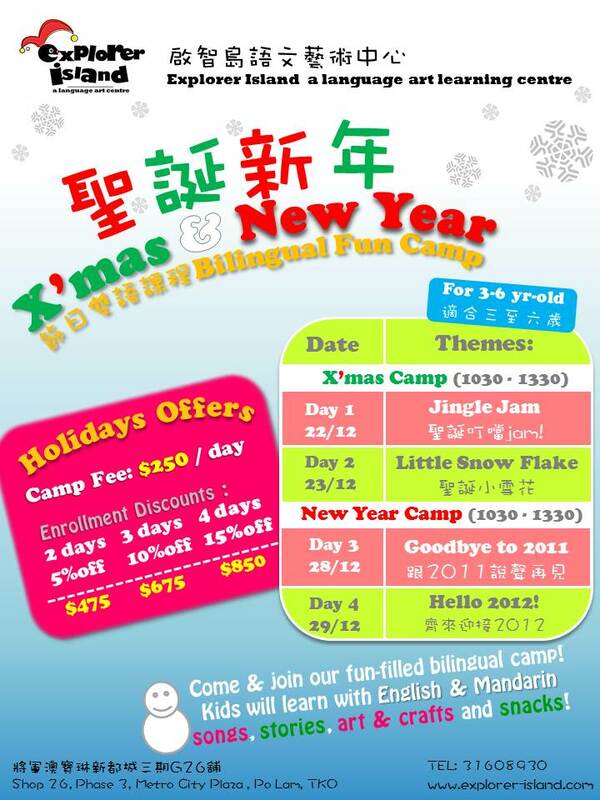 X'mas & New Year Bilingual Day Camp for Kids aged 3-6! 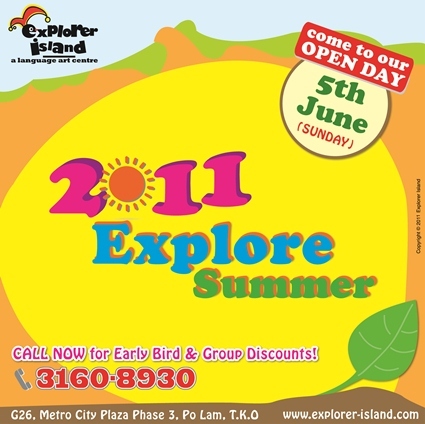 Bring your kids to Explorer Island, he/ she will have a wonderful holiday with us. a great experience before they start a whole new year! Limited seats, so don't miss it!! For enquiries, please call 3160 8930 or come to visit our centre. 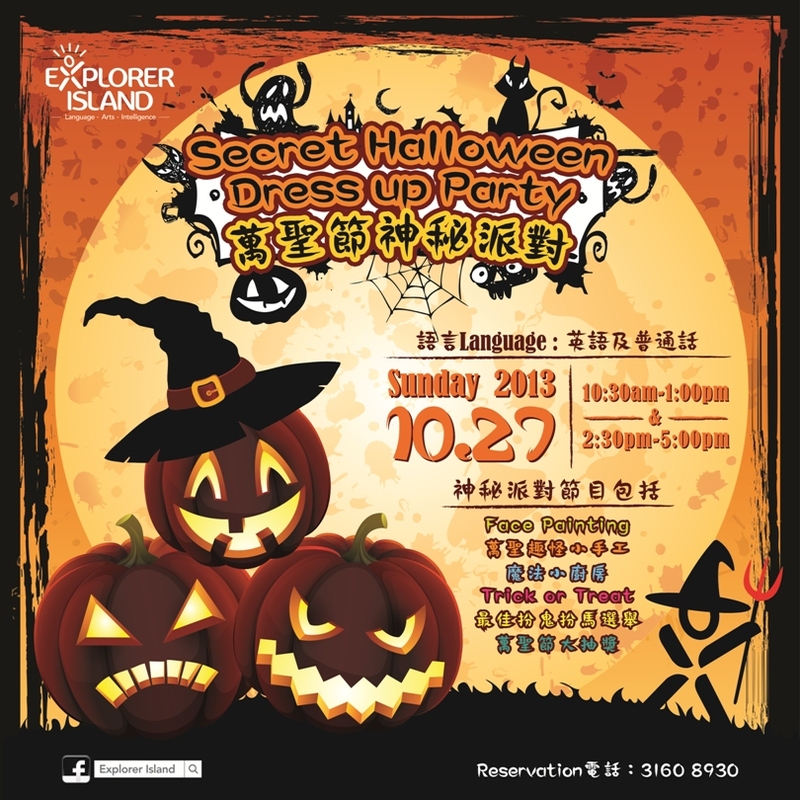 Secret Halloween Dress up Party @ Explorer Island! 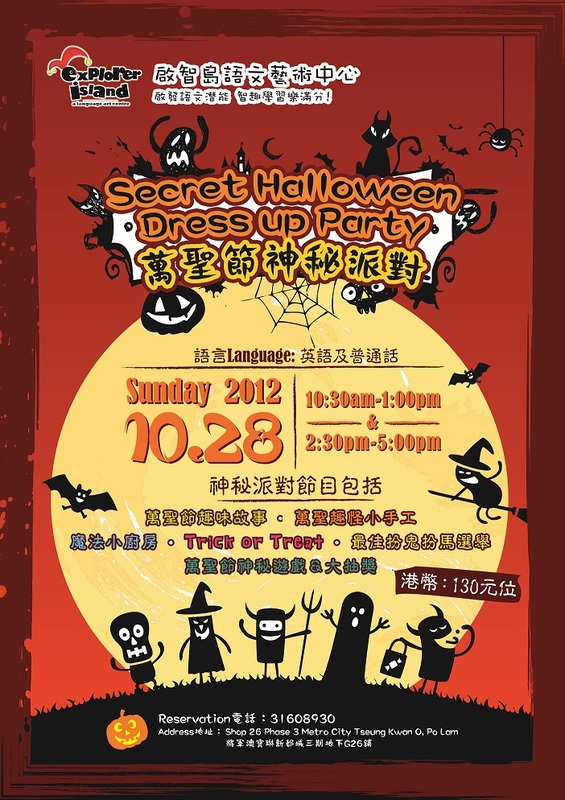 Get ready for our Secret Halloween Dress-up Party! 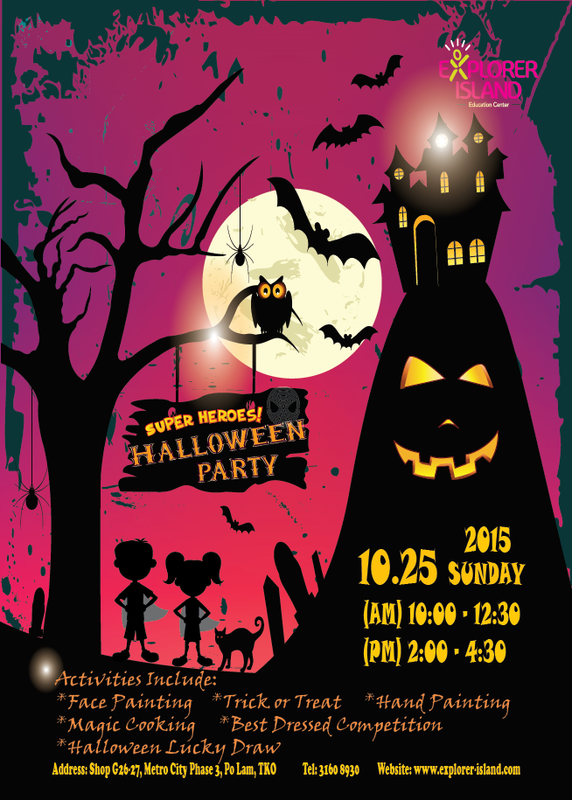 All our teachers will be here with your kids to celebrate this year Halloween, everyone will have lots of fun in here and learn more about Halloween. 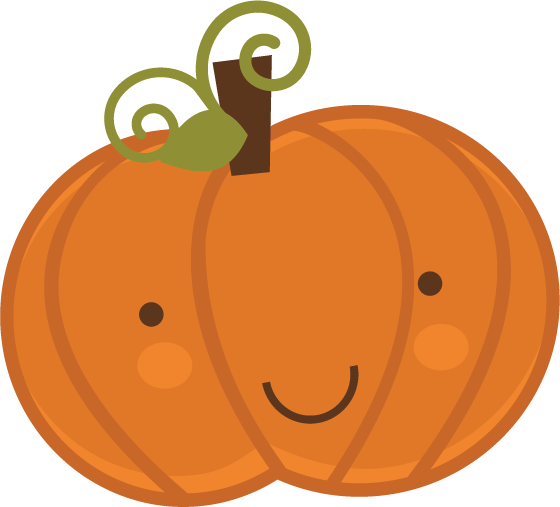 To promote our Fun Fun Sunday Camp, this Halloween party camp (2.5 hrs) only costs $100 per seat, call and book in advance to avoid disappointment! 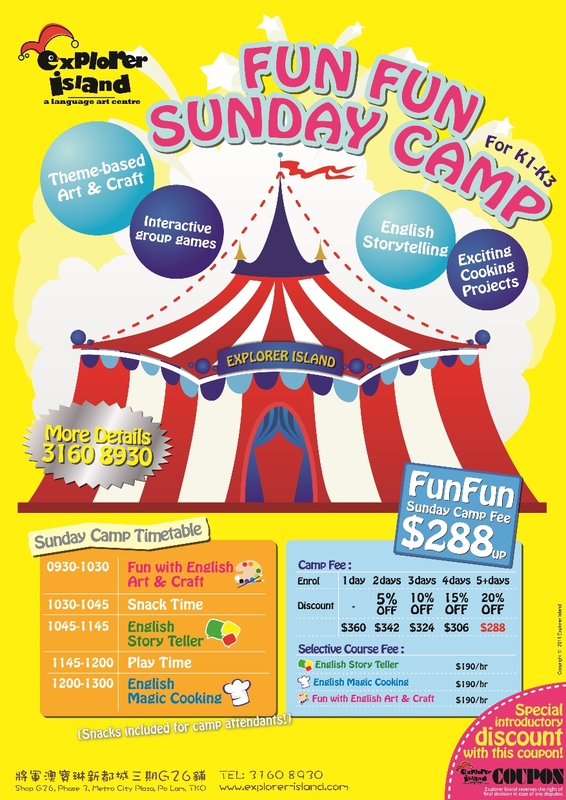 Come and Join our "Fun Fun Sunday Camp", your child will experience a fun-filled journey in learning English with our native speaking teachers! 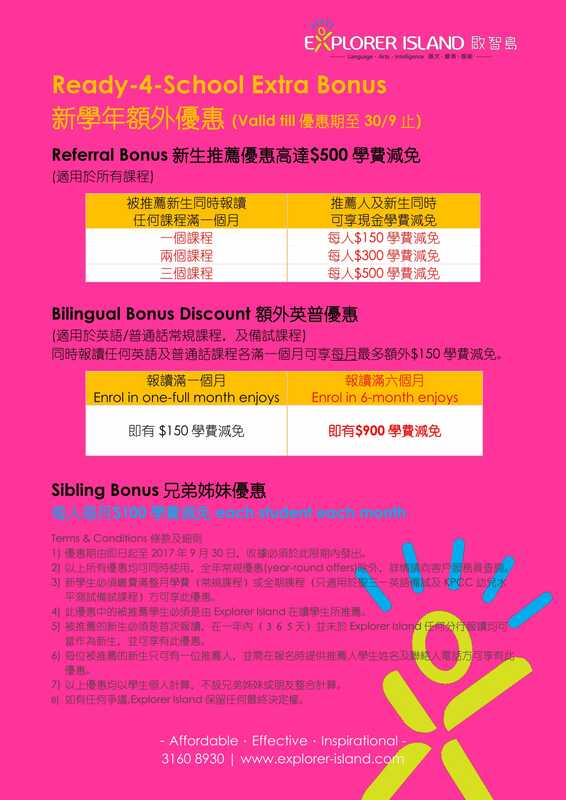 For more details, please call 3160 8930. 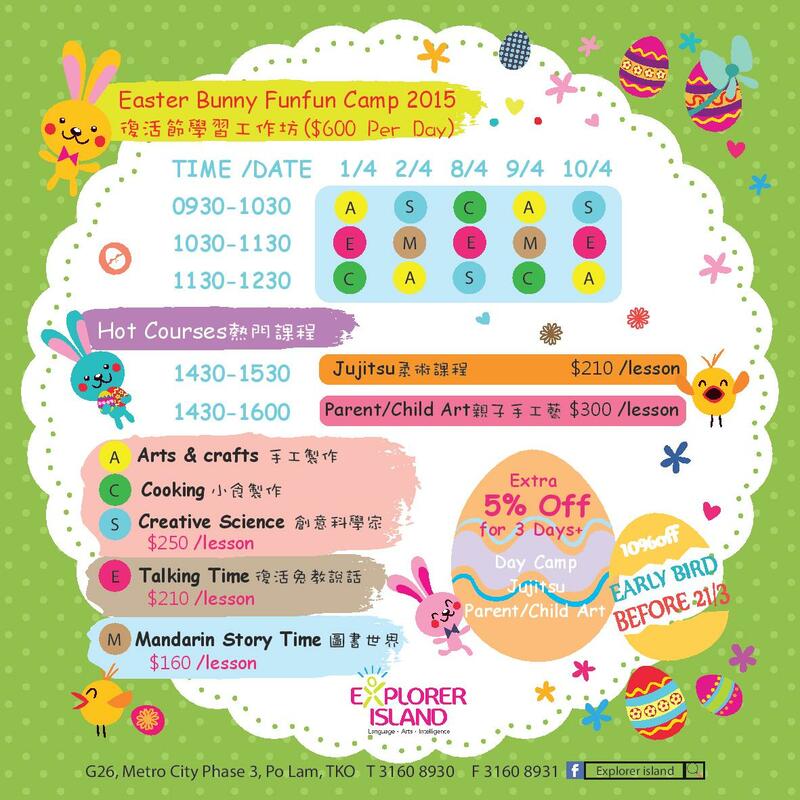 Limited seats, call us to reserve a seat for your kid! 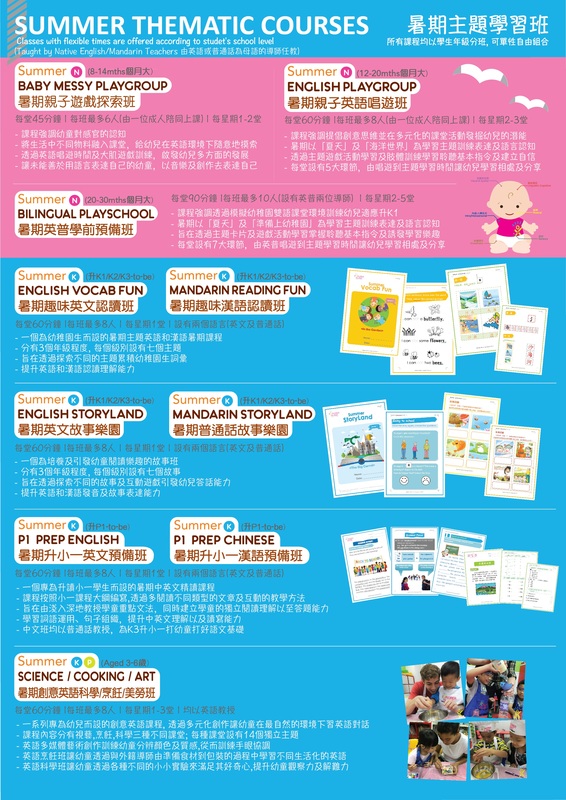 Our Fun with English Art & Craft class was being introduced by the PreSchool magazine,one of the most popular magazines for parents and children. 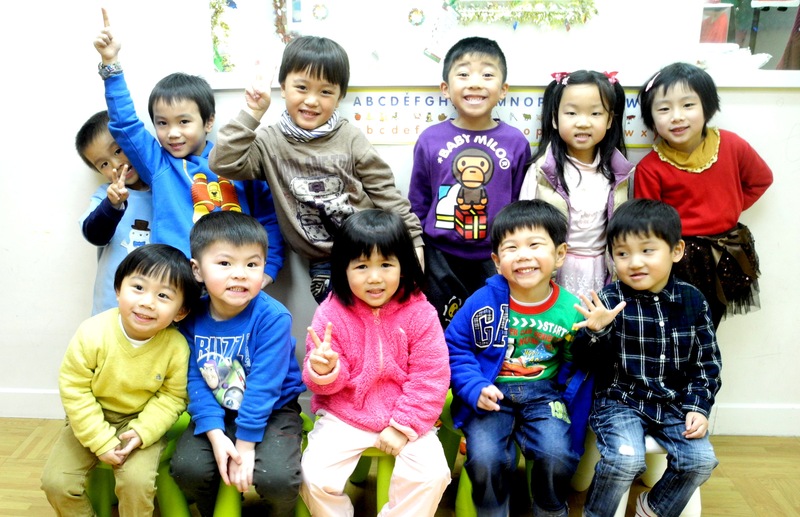 They have interviewed both our teachers and parents. 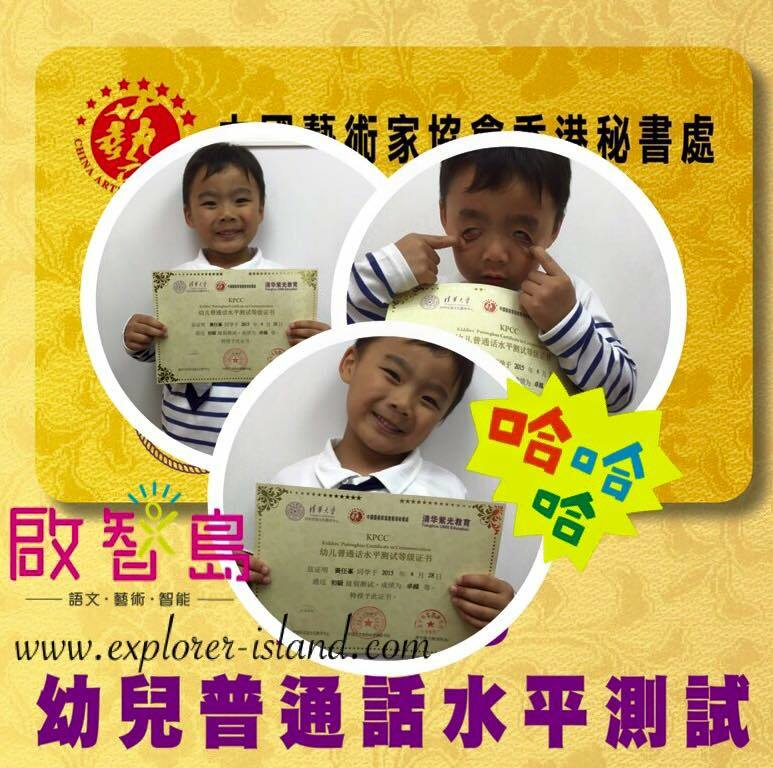 It was a really good experience and we have got great comments from parents as well! 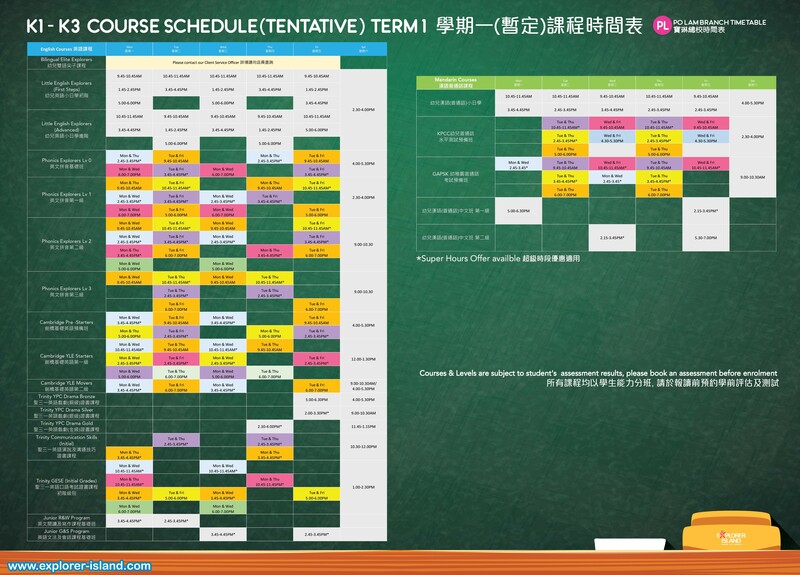 They have captured some of the class activities, see below to read more. 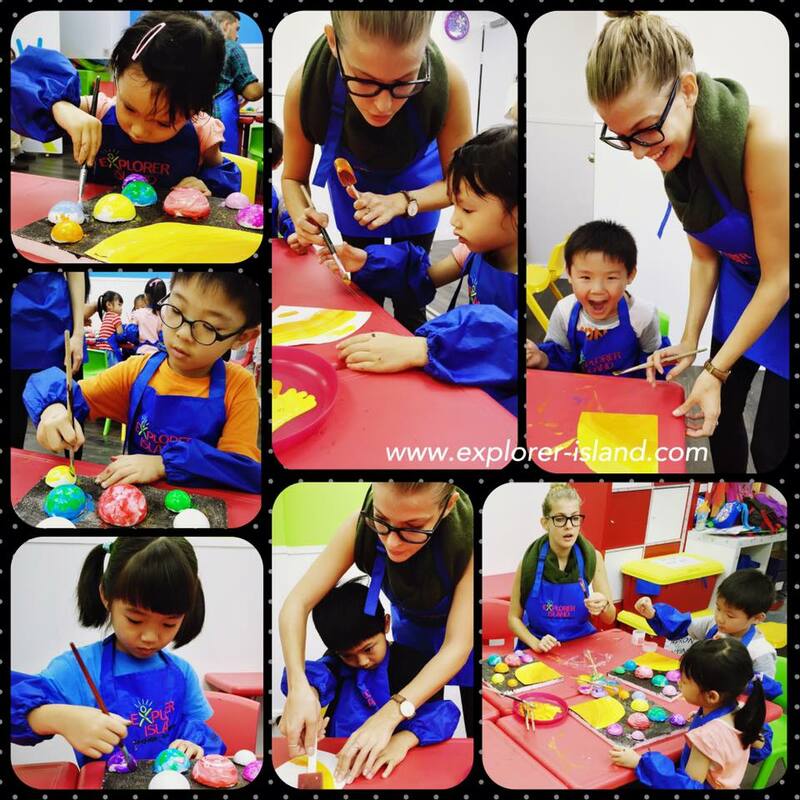 Join our Fun with English Art & Craft course, your child will have lots of fun in learning English! 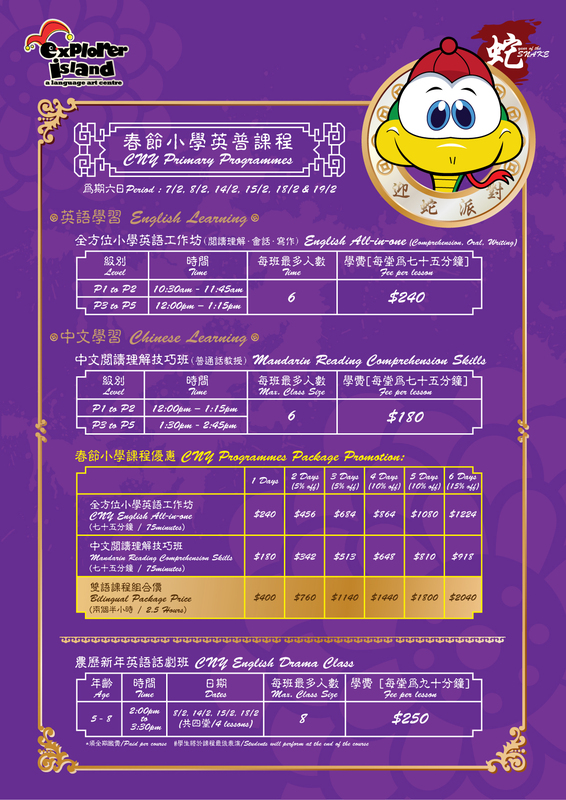 Any enquiries, please call 3160 8930 or visit our centre! 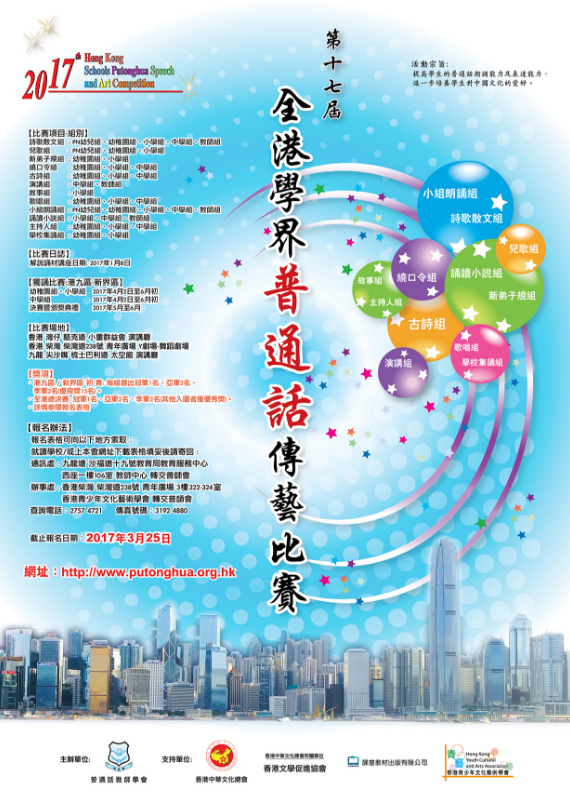 OPEN DAY on 5th JUNE! 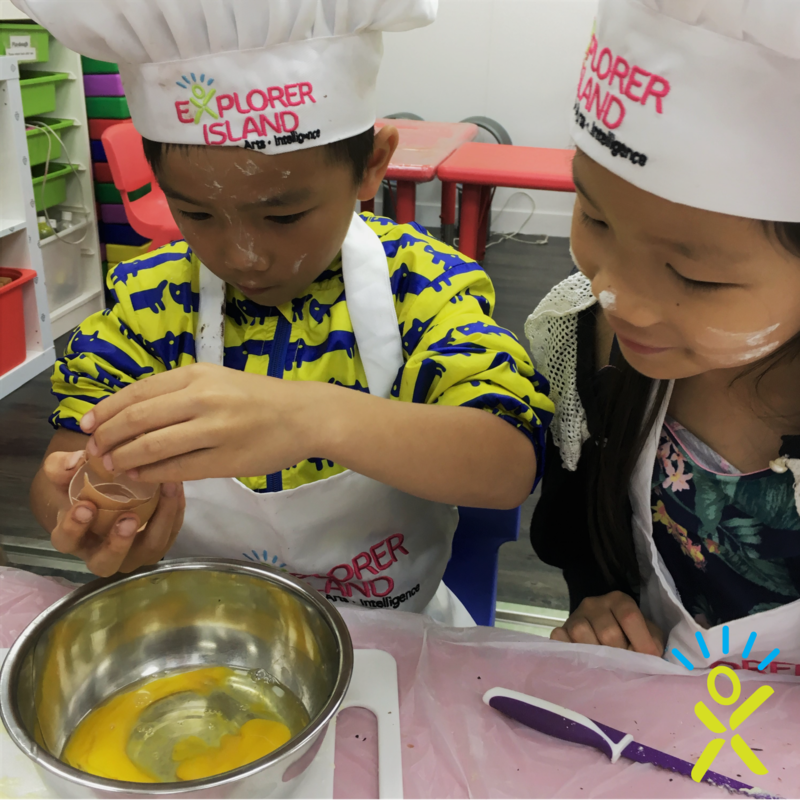 Explorer Island will have an Open Day on 5th June, where you and your family can enjoy fun and games, view our centre and learn about our summer programmes. 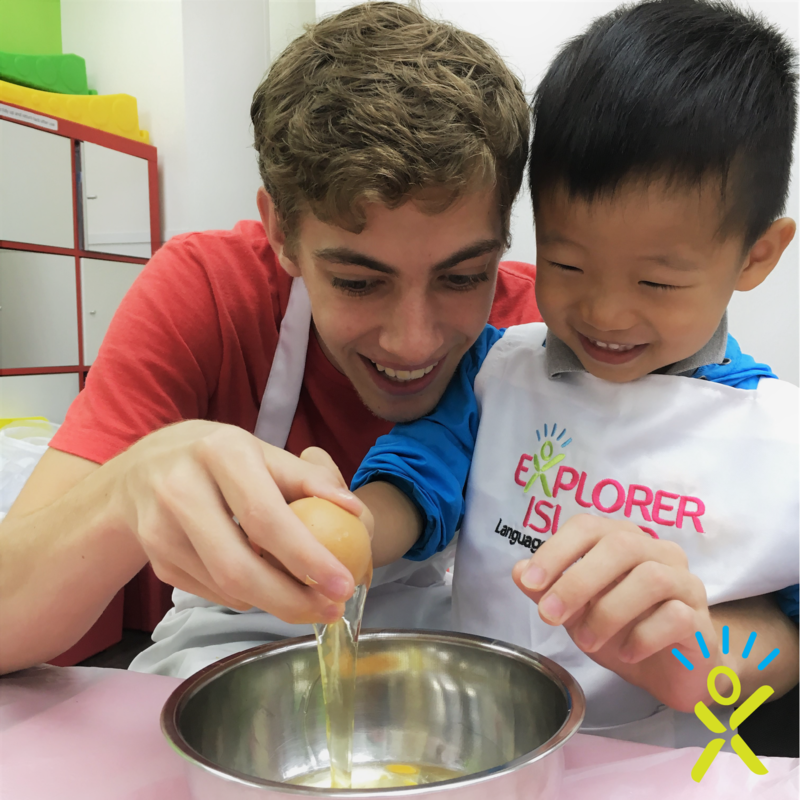 This year we have specially organised different day camps for both kindergarten and primary students. 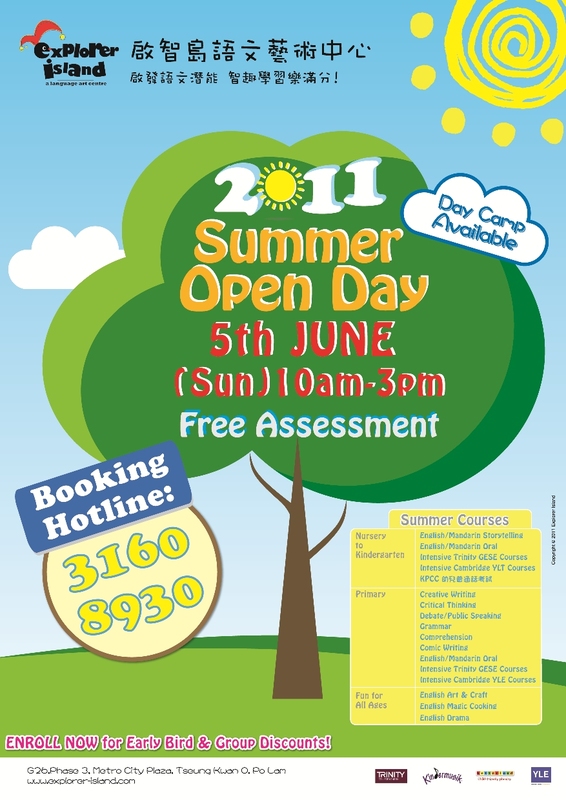 Come and visit us on our Open Day, we also offer free assessments during the Open Day. Call us on 3160-8930 for more details! For any enquiries, please call us on 3160-8930 or come to visit our centre! 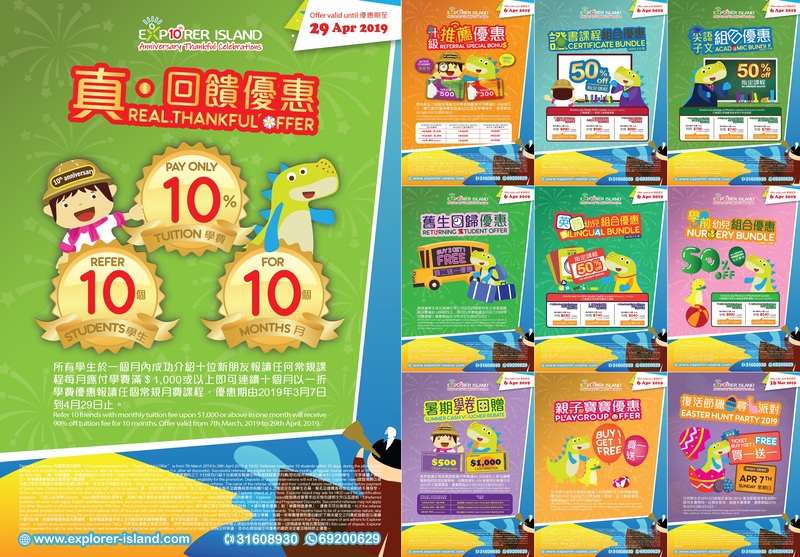 Your child will be having a long long vacation, planning what to do during such long holiday? 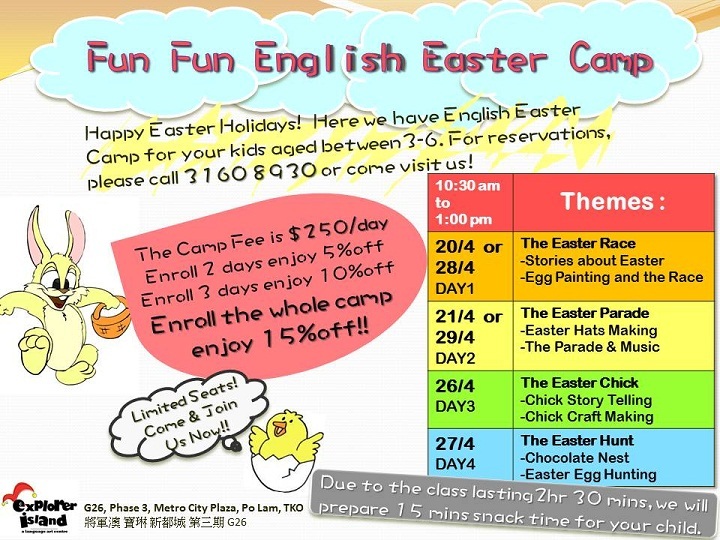 Come and join our Fun Fun Easter English Camp! 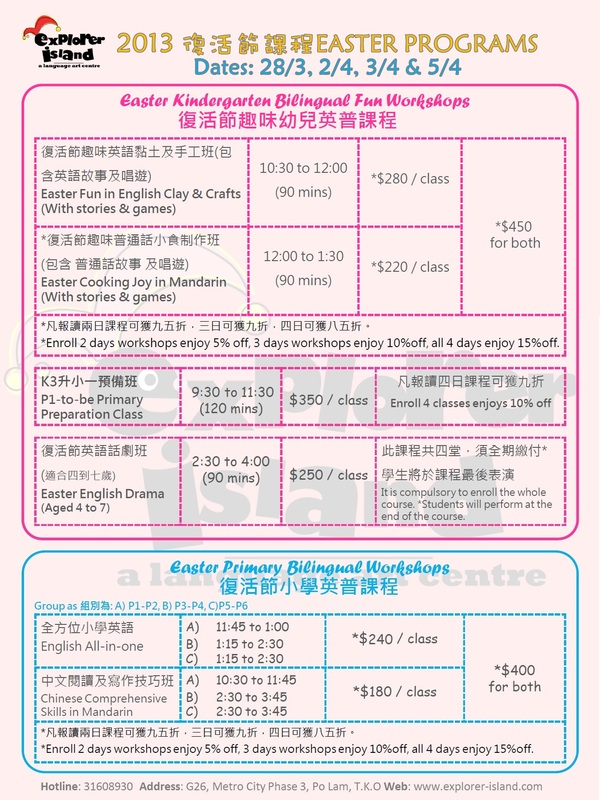 Your child will learn more about Easter Holiday and have lots of fun with us. 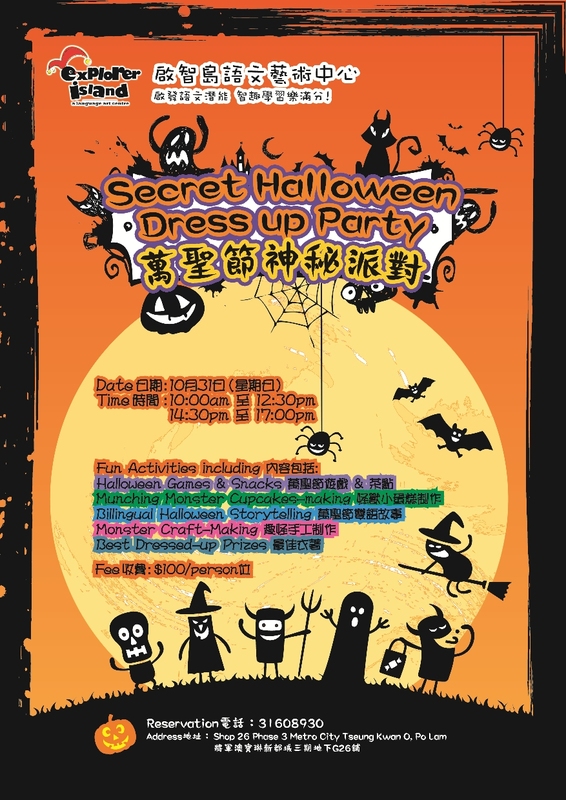 We have limited seats, book in advance to avoid disappointments! For reservations, please call 3160-8930 or come to visit our centre. 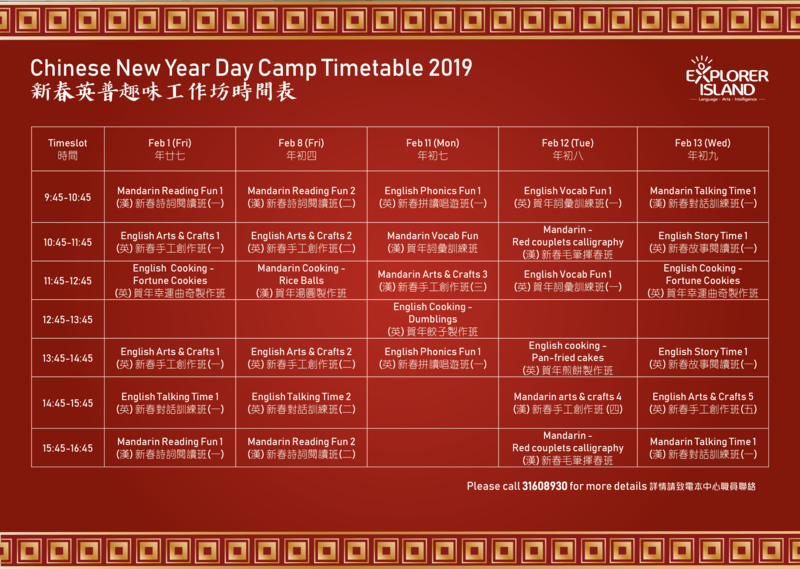 To celebrate Chinese New Year, we are now offering a FREE studio photo package worth $668 to our customers who enrol any courses for $2,000 or more. Give us a call for any enquiries! Happy Holidays! Kung Hei Fat Choy! 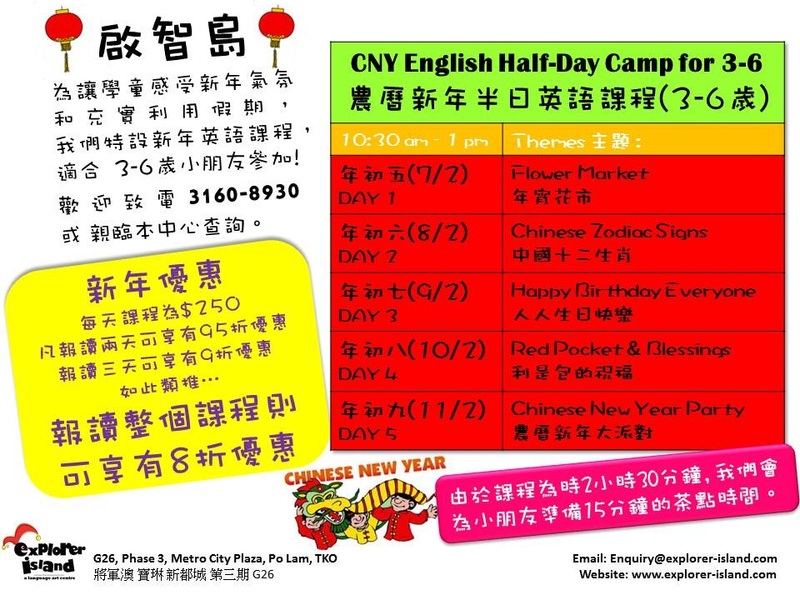 Join our fun filled yet educational CNY program specifically tailer-made for K1 to P3 students during their long school breaks! 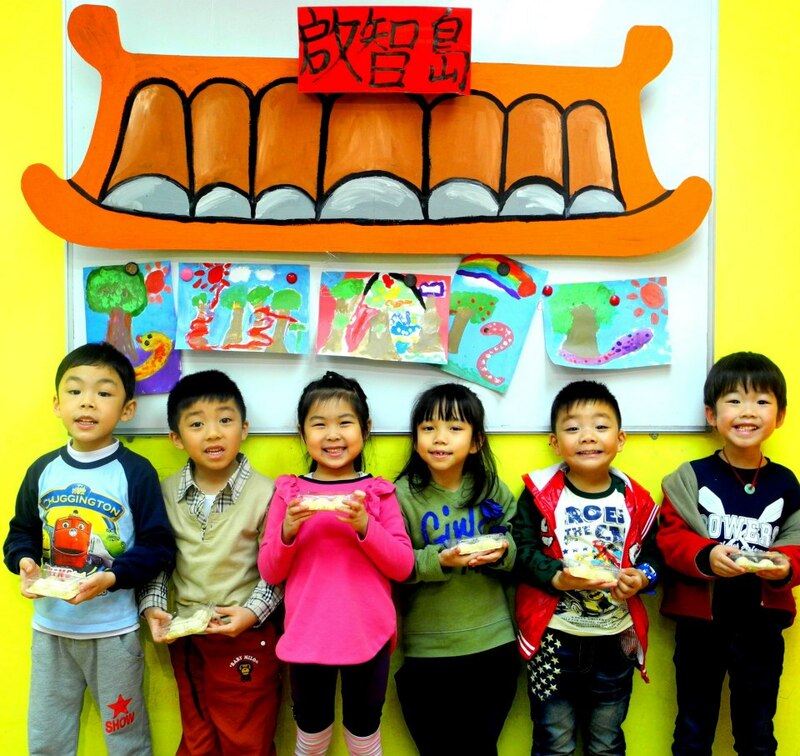 All lessons conducted by our qualified Native English Teachers. 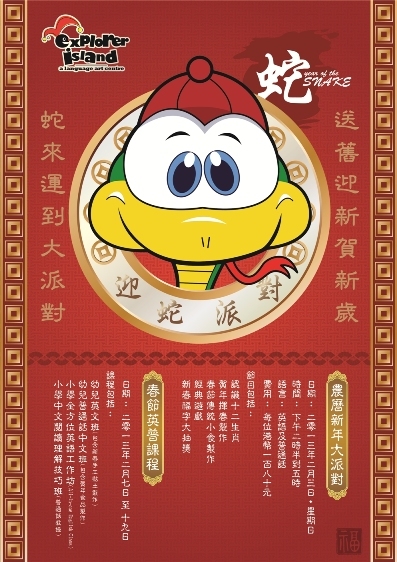 Great start for the Year of the Rabbit!! 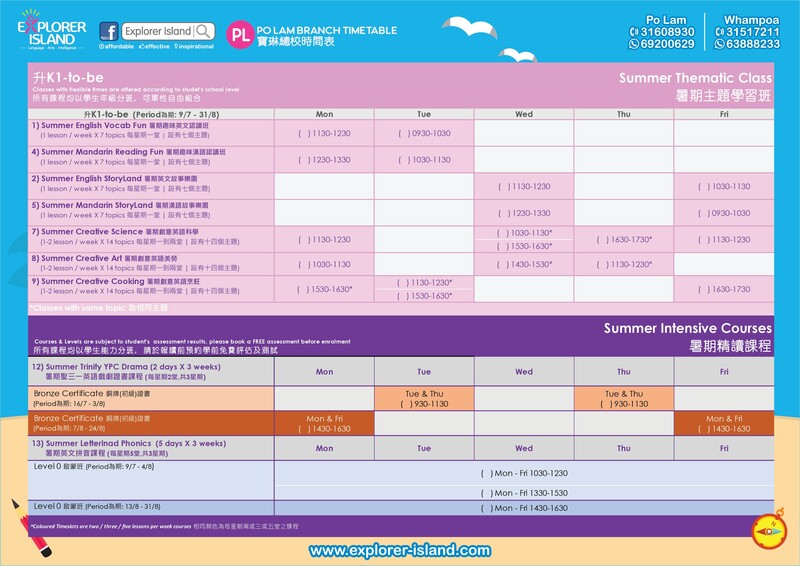 A great opportunity for parents to meet and talk to our NATIVE SPEAKING teachers and understand the full suite of language courses available for students. 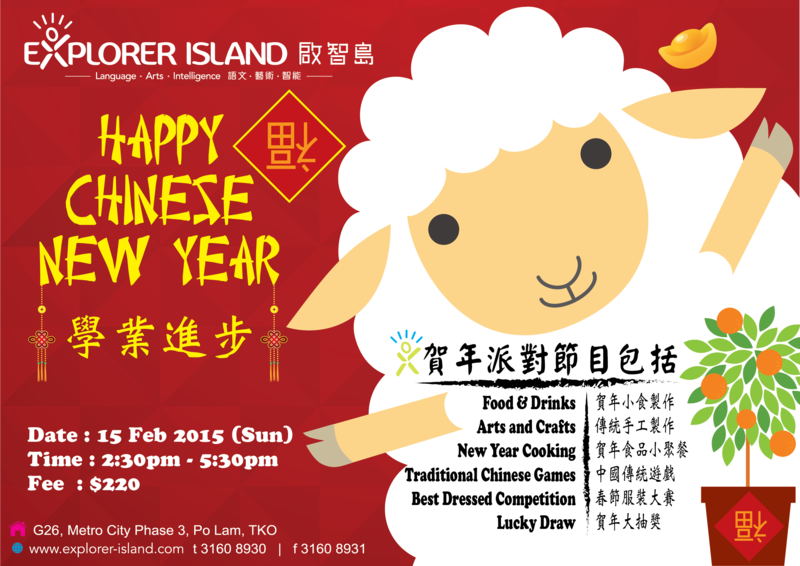 Light refreshement will be served and we have prepared some fun-filled activities for everyone! 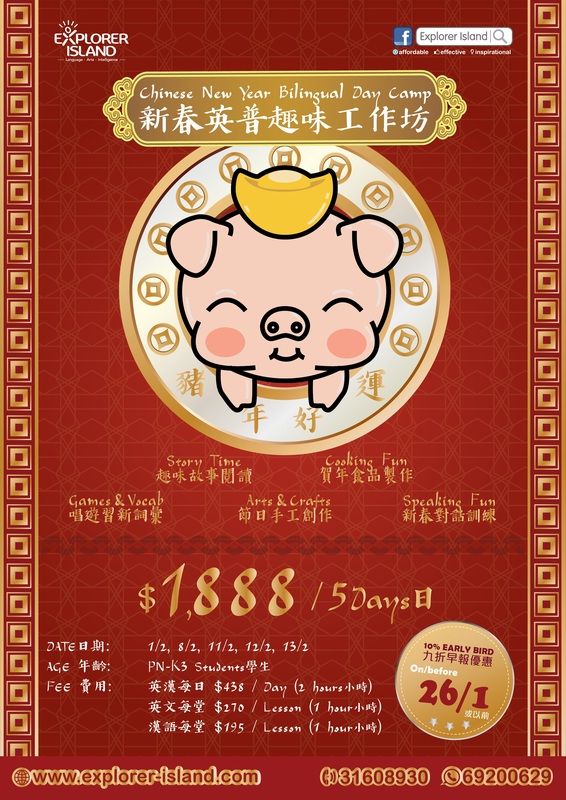 Please call our client servicing team at 3160-8930 for details and reservation now! Plenty of stories, candies and cookies for this special evernt! Mark your calendar and it's going to be fun ! 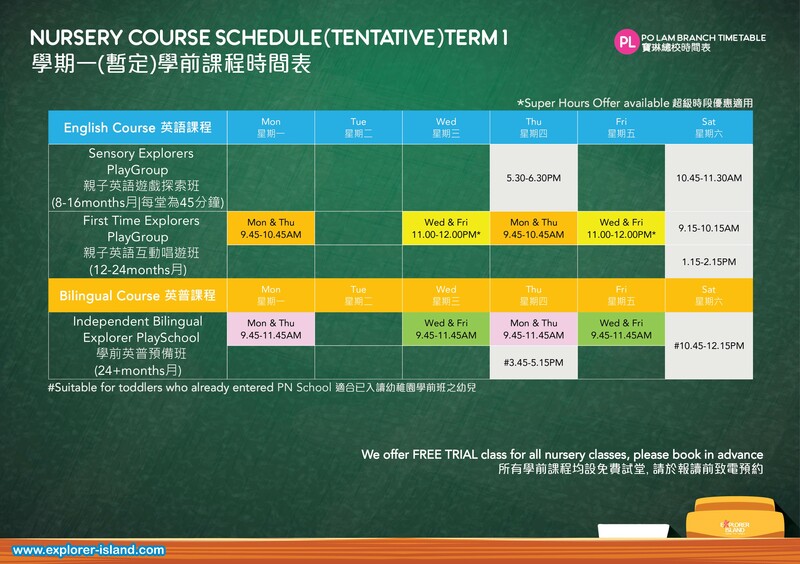 A great opportunity to meet our teachers in person, understand our full range of courses, and experience a demo class completely free of charge. 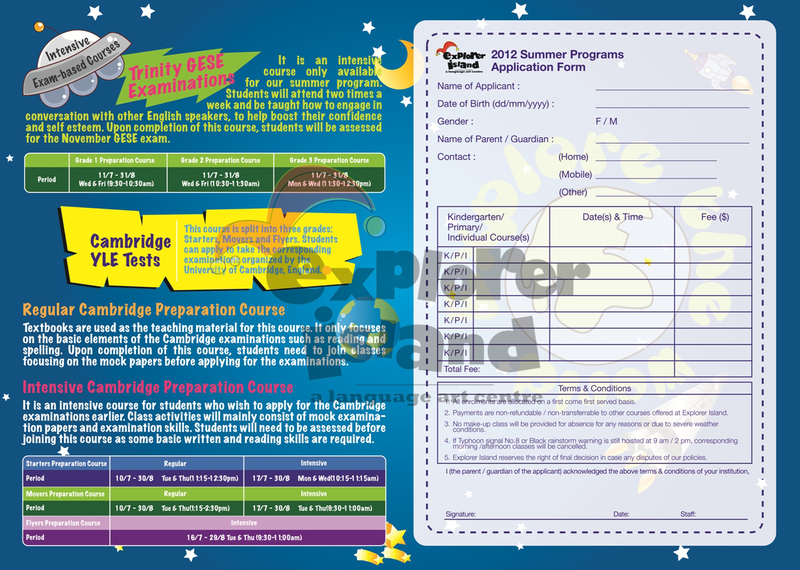 We offer light refreshment and free assessment. 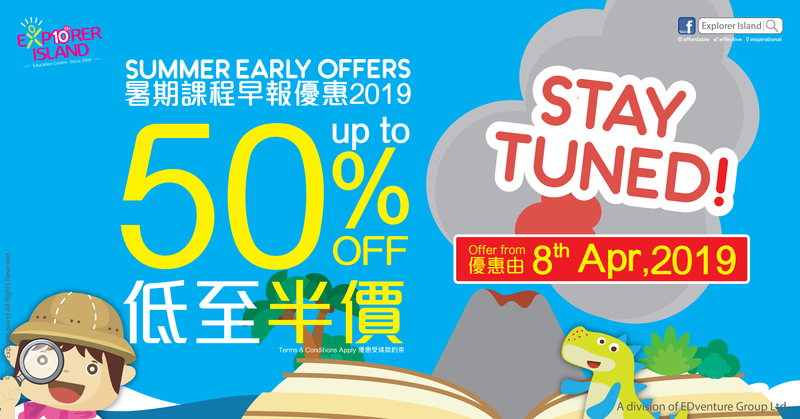 Furthermore, enrolling on the day will receive special discounts. Seats are limited - please call 3160-8930 for reservation now ! 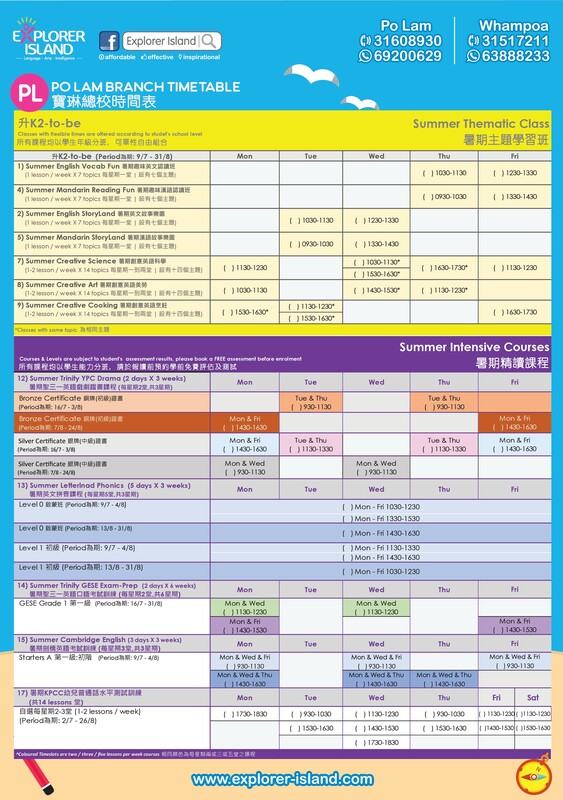 (NEW) FRENCH COURSE LAUNCHED ...."FREE" TRIAL CLASS EVERY MONDAY !!! 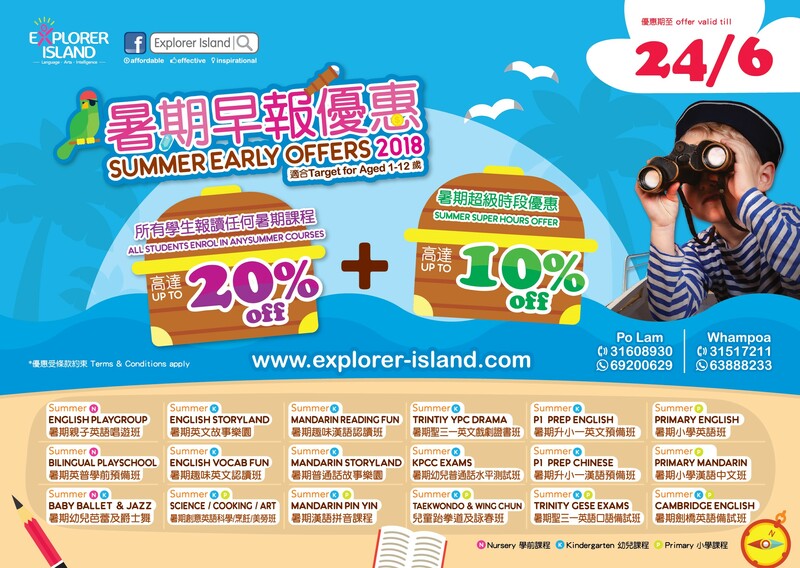 BOOK NOW !!! 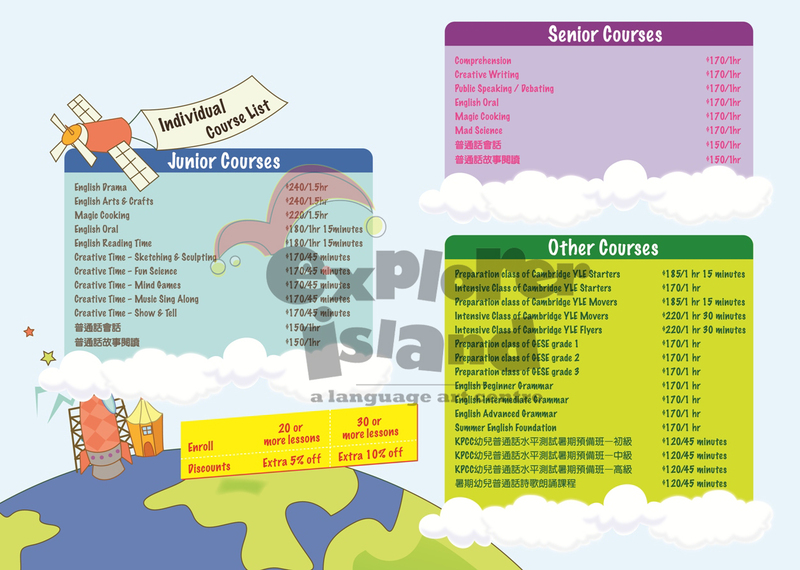 Explorer Island is launching a brand new French course for beginners. 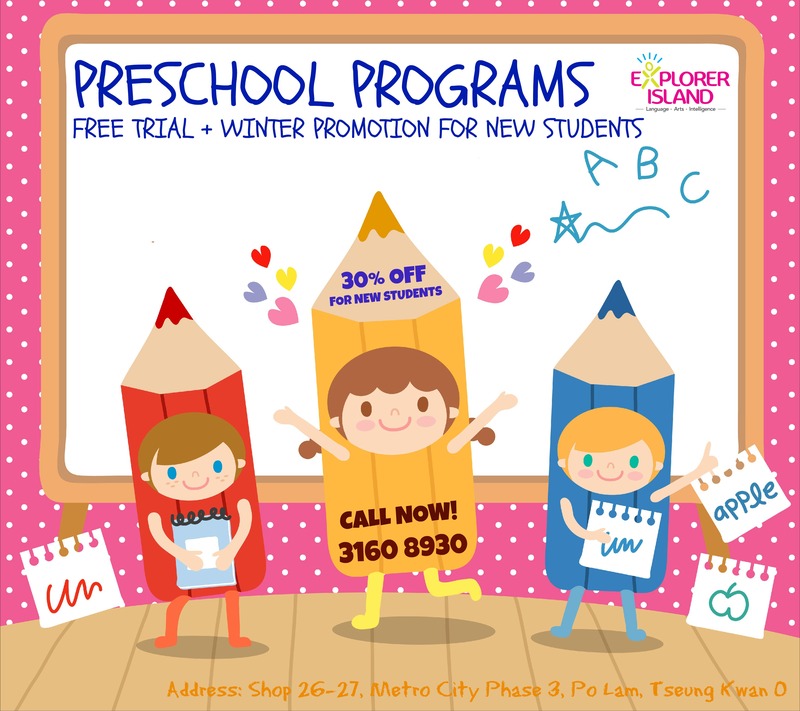 We are now offering FREE trial class on Monday at 5:30 - 6:30 pm. 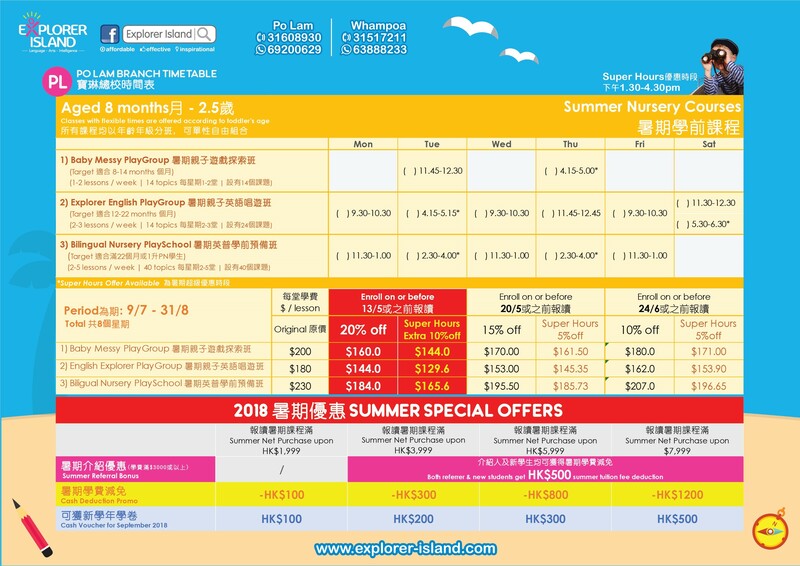 Please call our Cient Service team for booking in advance. ANNIVERSARY CELEBRATION .... FREE STUDIO PHOTO PACKAGE TO GIVE AWAY !!! 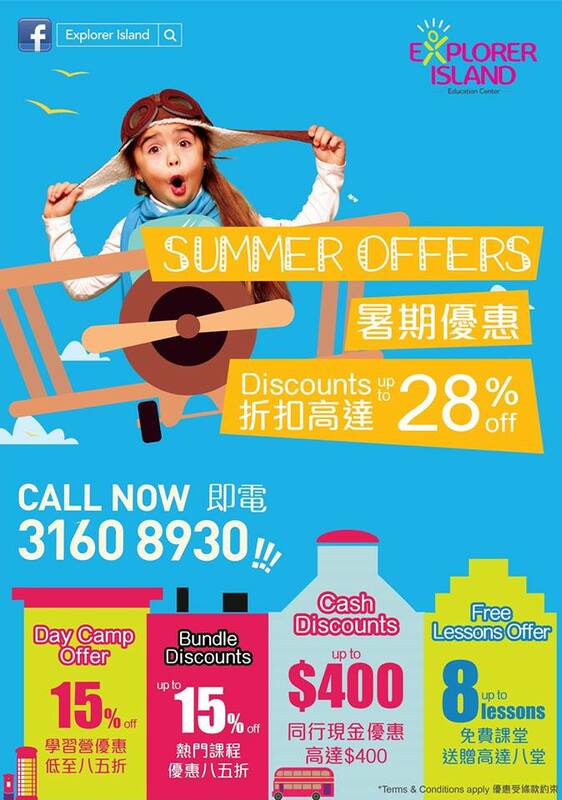 FREE studio photo package (worth $668) for Summer Program enrolment. To celebrate our 1st anniversary, we are now offering a FREE studio photo package worth $668 to our customers who enrol our Summer Program courses for $2,500 or more.